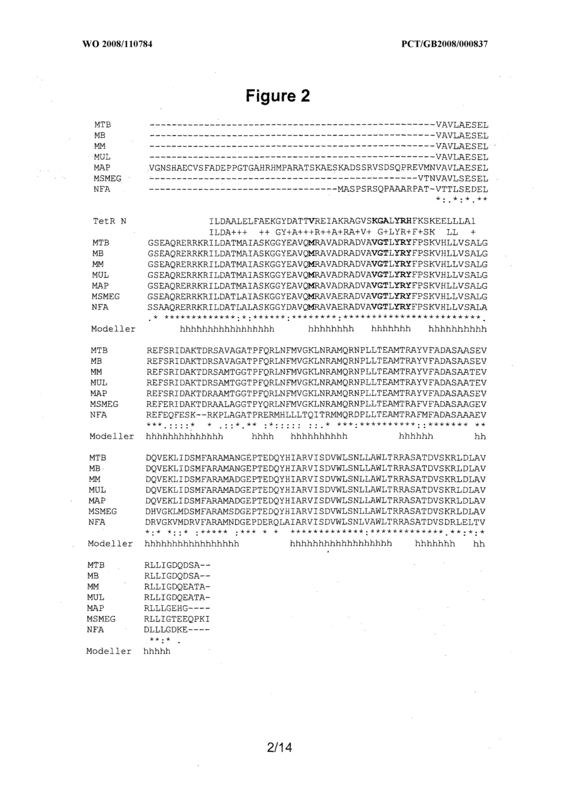 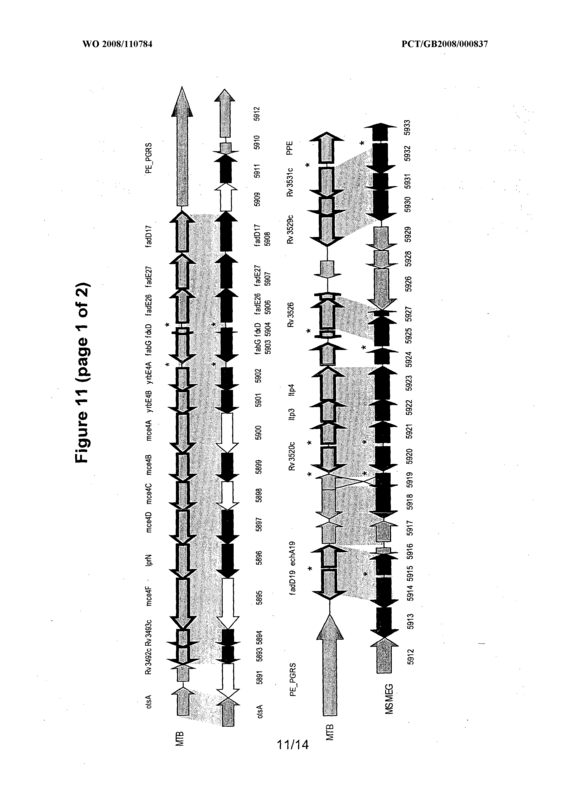 A method of identifying an agent which modulates at least one activity or function of the Mycobacterium tuberculosis protein Rv3574 or an orthologue thereof from another actinomycete, the method comprising providing Rv3574 or the orthologue thereof, providing double stranded DNA (dsDNA) comprising the sequence X<SUB>1</SUB>X<SUB>2</SUB>X<SUB>3</SUB>AACX<SUB>4</SUB>X<SUB>5</SUB>GTX<SUB>6</SUB>X<SUB>7</SUB>X<SUB>8</SUB>X<SUB>9</SUB> (SEQ ID No: 2) under conditions which allow the Rv3574 or the orthologue to bind to the dsDNA, providing a test agent, and determining whether the test agent modulates at least one activity or function of the M. tuberculosis Rv3574 or the orthologue thereof. 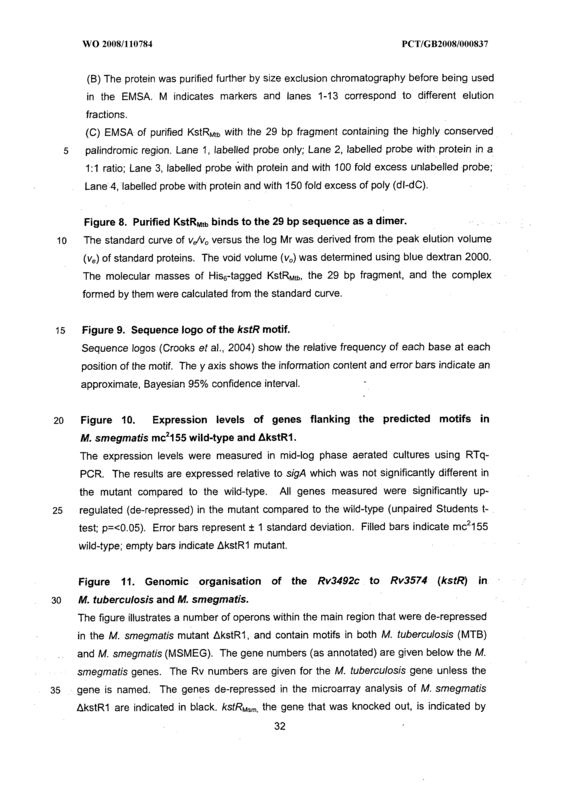 X6 is G or T X7 is A, C, G or T X8 is A, C, G or T and X9 is A, G or T; providing a test agent; and determining whether the test agent modulates at least one activity or function of the M. tuberculosis Rv3574 or the orthologue thereof. 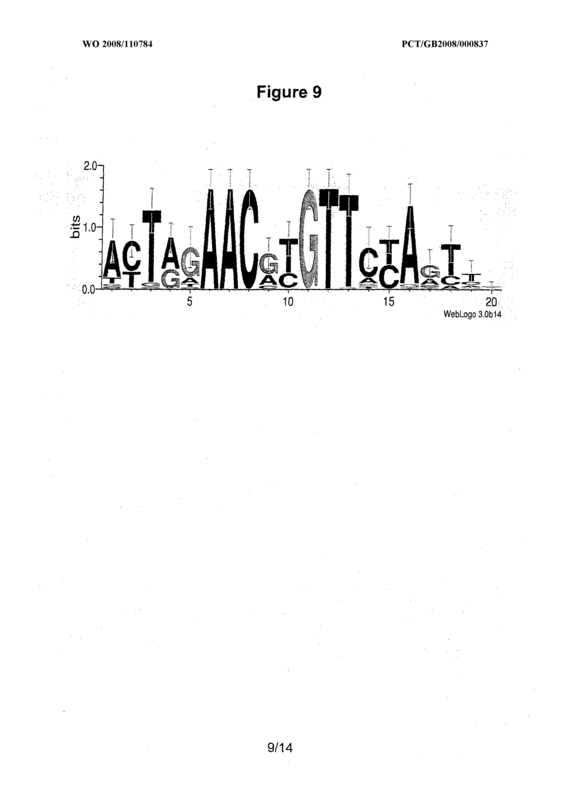 X6 is T, and X9 is A.
X4 is A, C, G or T, but preferably A, C or G X5 is A, C, G or T, but preferably C, G or T X6 is G or T X7 is A, C, G or T X8 is C or T and X9 is A, G or T.
X6 is T X7 is C and X9 is A. 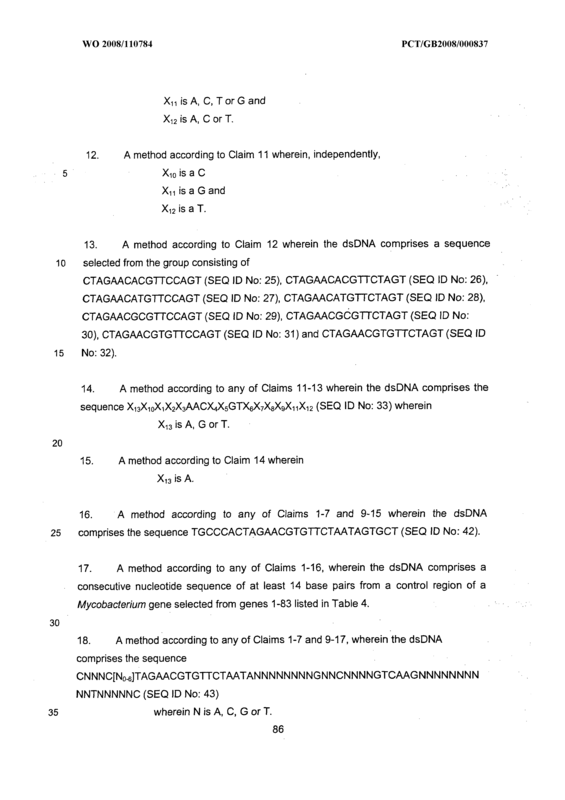 A method according to any of Claims 1-4 wherein when X1 is T, X9 is A. 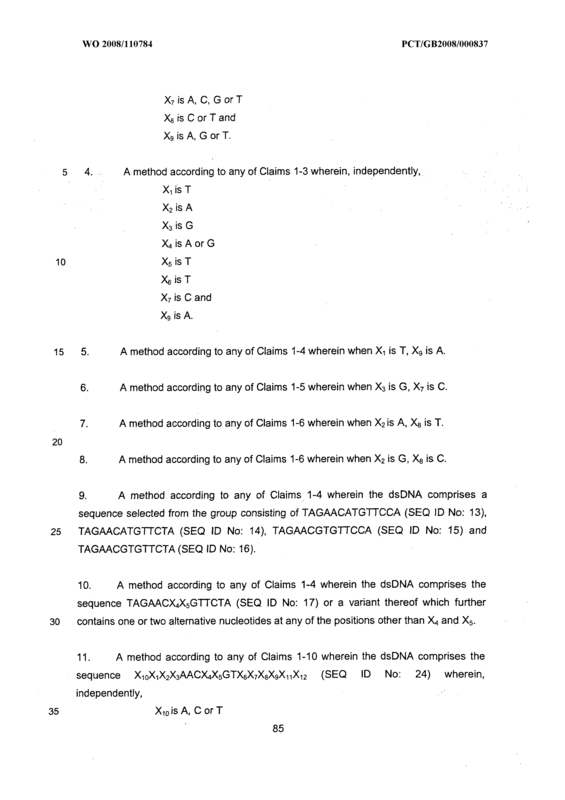 A method according to any of Claims 1-5 wherein when X3 is G, X7 is C.
A method according to any of Claims 1-6 wherein when X2 is A, X8 is T.
A method according to any of Claims 1-6 wherein when X2 is G, X8 is C.
A method according to any of Claims 1-4 wherein the dsDNA comprises a sequence selected from the group consisting of TAGAACATGTTCCA (SEQ ID No: 13), TAGAACATGTTCTA (SEQ ID NO: 14), TAGAACGTGTTCCA (SEQ ID No: 15) and TAGAACGTGTTCTA (SEQ ID NO: 16). 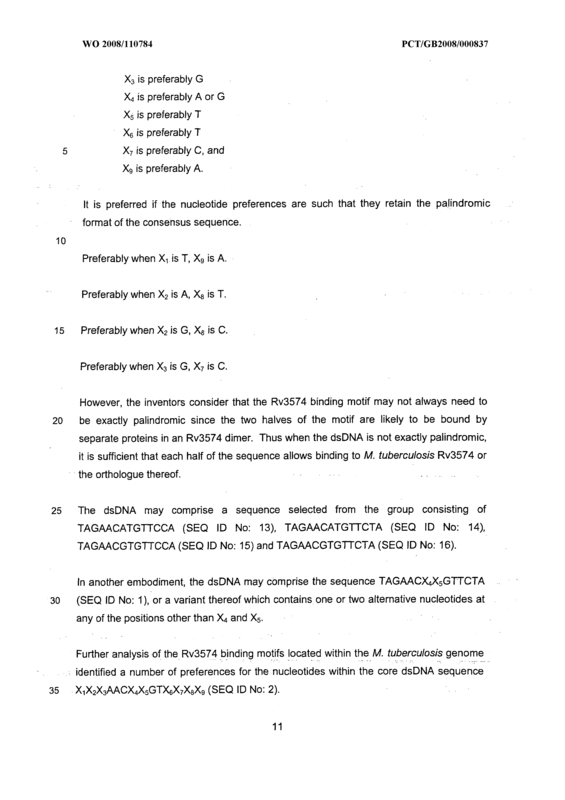 A method according to any of Claims 1-4 wherein the dsDNA comprises the sequence TAGAACX4X5GTTCTA (SEQ ID NO: 17) or a variant thereof which further contains one or two alternative nucleotides at any of the positions other than X4 and X5. 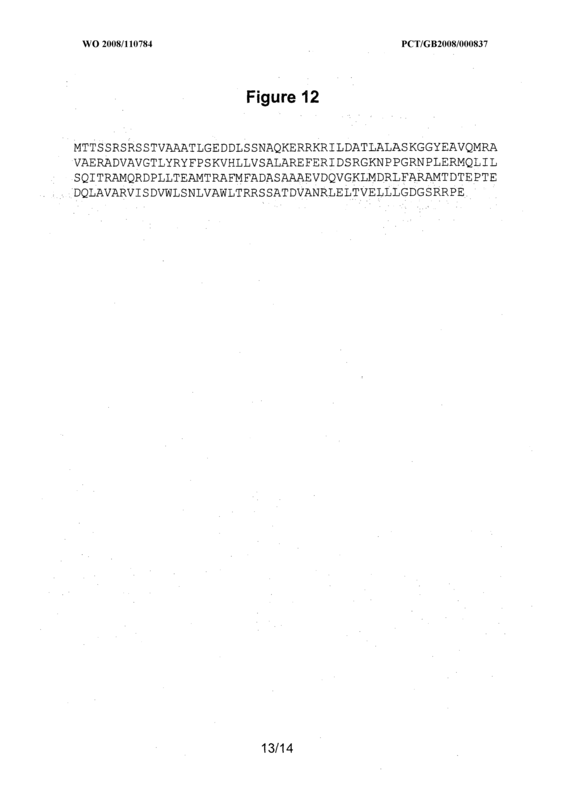 Xn is a G and X12 is a T.
CTAGAACACGTTCCAGT (SEQ ID NO: 25), CTAGAACACGTTCTAGT (SEQ ID No: 26), CTAGAACATGTTCCAGT (SEQ ID NO: 27), CTAGAACATGTTCTAGT (SEQ ID No: 28), CTAGAACGCGTTCCAGT (SEQ ID NO: 29), CTAGAACGCGTTCTAGT (SEQ ID No: 30), CTAGAACGTGTTCCAGT (SEQ ID NO: 31) and CTAGAACGTGTTCTAGT (SEQ ID No: 32). 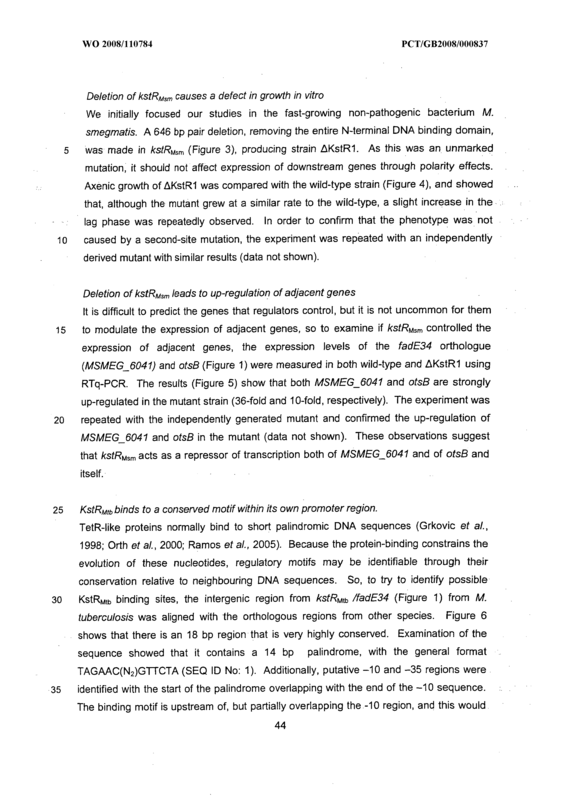 X13 is A, G or T.
A method according to any of Claims 1-7 and 9-15 wherein the dsDNA comprises the sequence TGCCCACTAGAACGTGTTCTAATAGTGCT (SEQ ID No: 42). 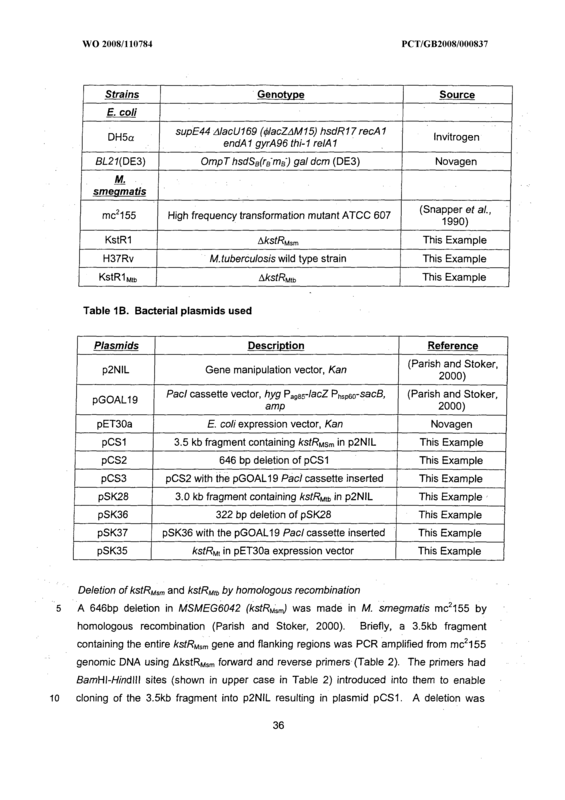 A method according to any of Claims 1-16, wherein the dsDNA comprises a consecutive nucleotide sequence of at least 14 base pairs from a control region of a Mycobacterium gene selected from genes 1-83 listed in Table 4. 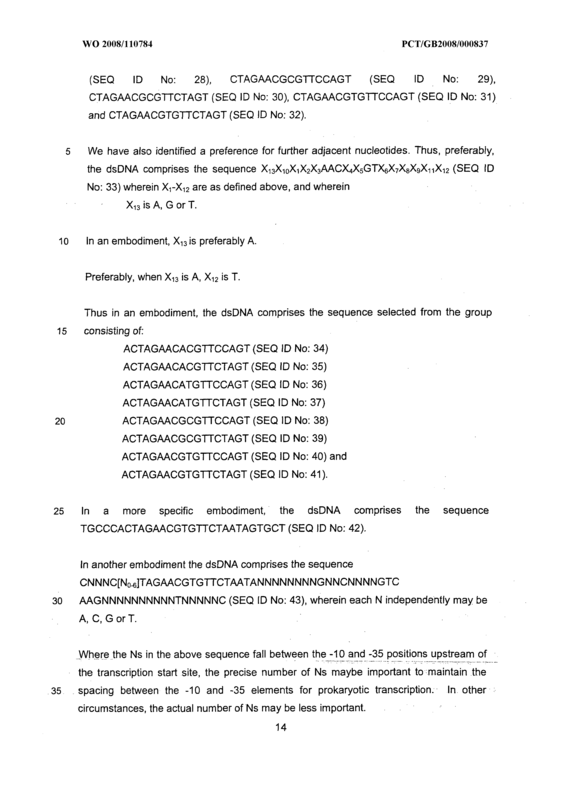 CNNNCINo^TAGAACGTGTTCTAATANNNNNNNNGNNCNNNNGTCAAGNNNNNNNN NNTNNNNNC (SEQ ID No: 43) wherein N is A, C, G or T.
A method according to any of Claims 1-18 wherein Rv3574 is M. tuberculosis Rv3574 (Figure 2). 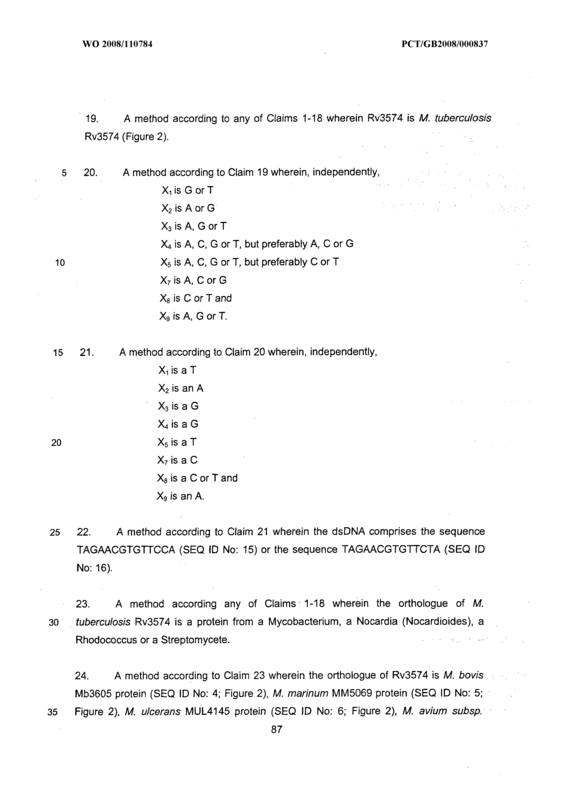 A method according to Claim 21 wherein the dsDNA comprises the sequence TAGAACGTGTTCCA (SEQ ID NO: 15) or the sequence TAGAACGTGTTCTA (SEQ ID No: 16). 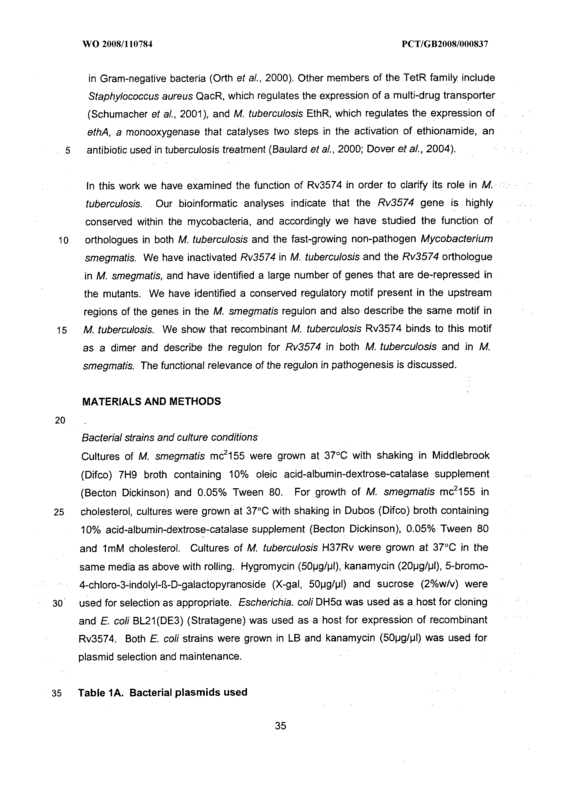 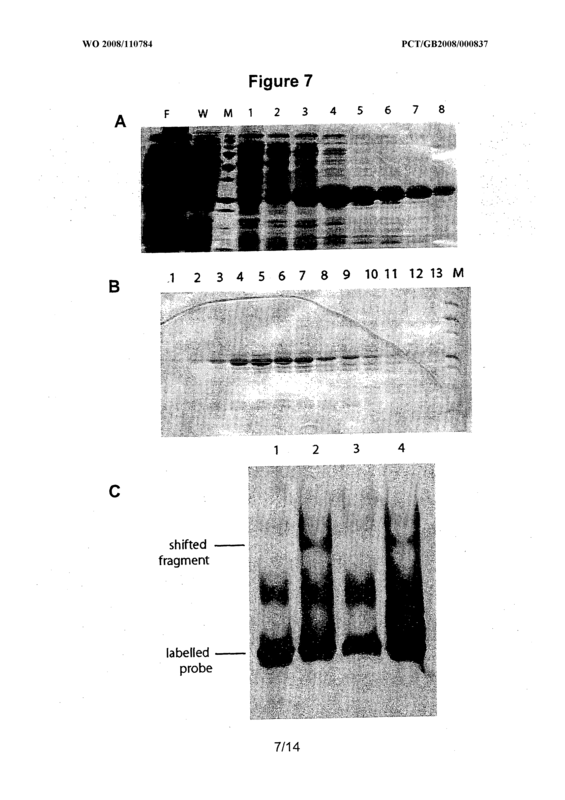 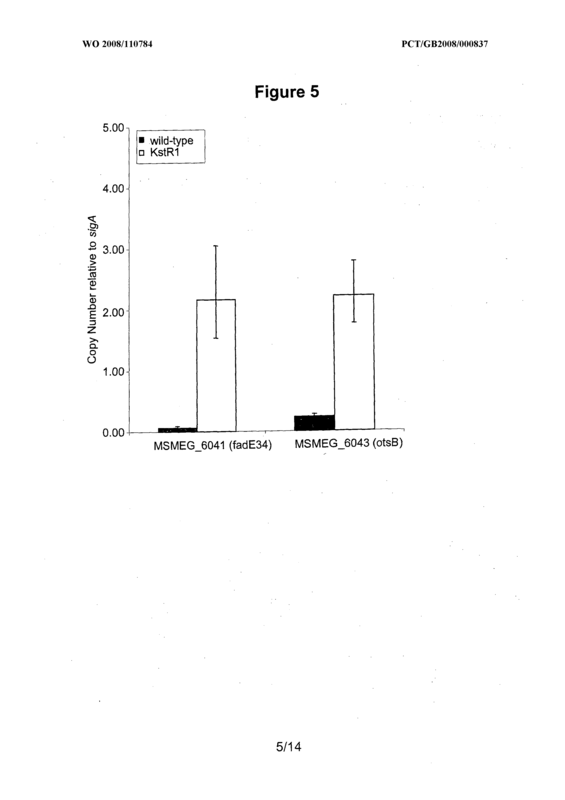 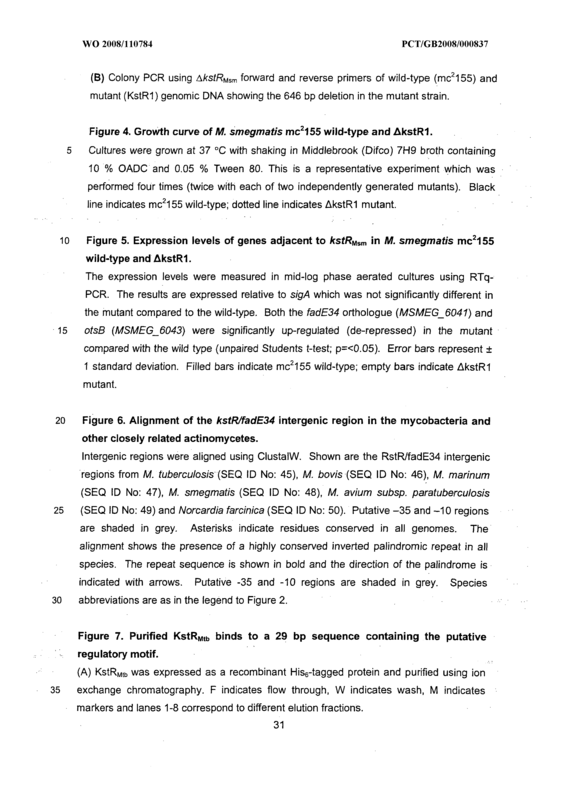 A method according to Claim 24 wherein the orthologue of the M. tuberculosis Rv3574 protein is M. smegmatis MSEG_6042 protein (SEQ ID No: 8; Figure 2). 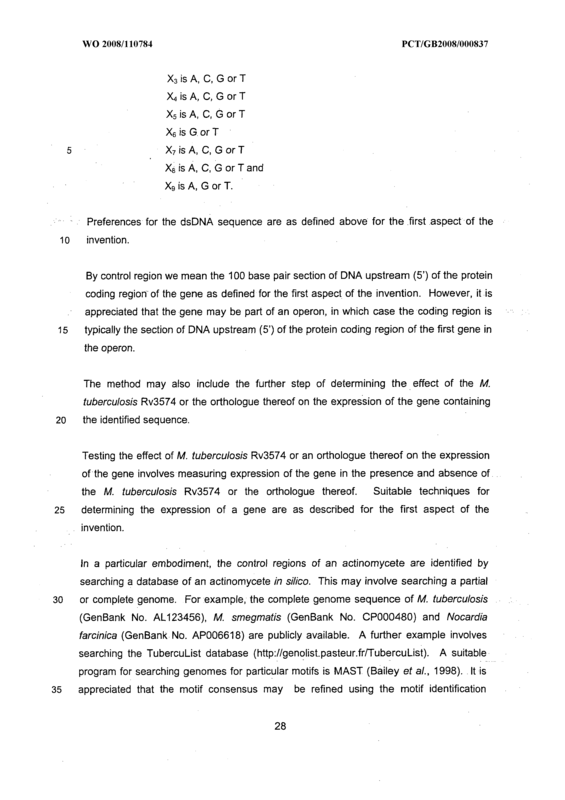 X8 is a C or T and X9 is an A. 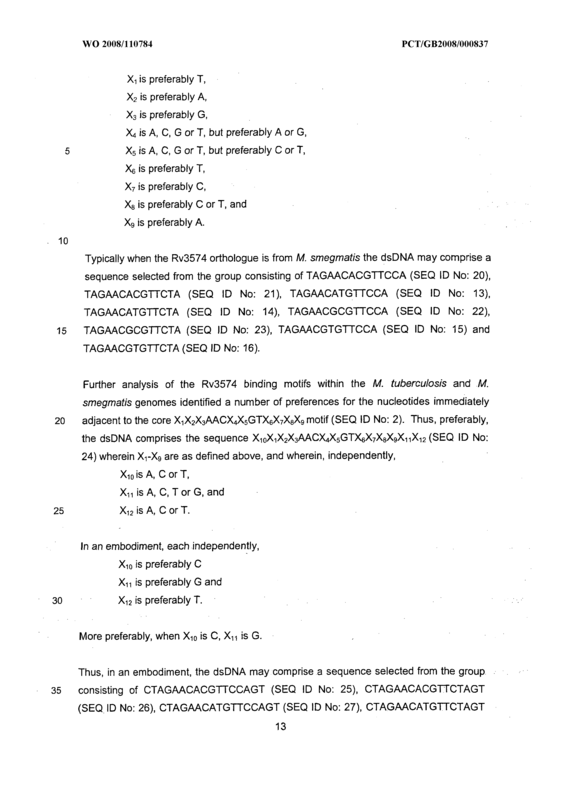 A method according to Claim 26 wherein the dsDNA comprises the sequence selected from the group consisting of TAGAACACGTTCCA (SEQ ID No: 20), TAGAACACGTTCTA (SEQ ID NO: 21), TAGAACATGTTCCA (SEQ ID No: 13), TAGAACATGTTCTA (SEQ ID NO: 14), TAGAACGCGTTCCA (SEQ ID No: 22), TAGAACGCGTTCTA (SEQ ID NO: 23), TAGAACGTGTTCCA (SEQ ID No: 15) and TAGAACGTGTTCTA (SEQ ID NO: 16). 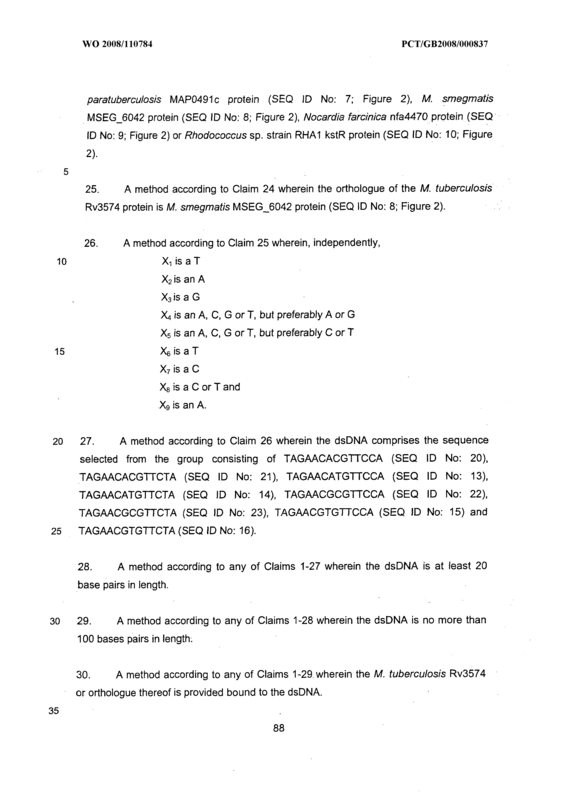 A method according to any of Claims 1-27 wherein the dsDNA is at least 20 base pairs in length. 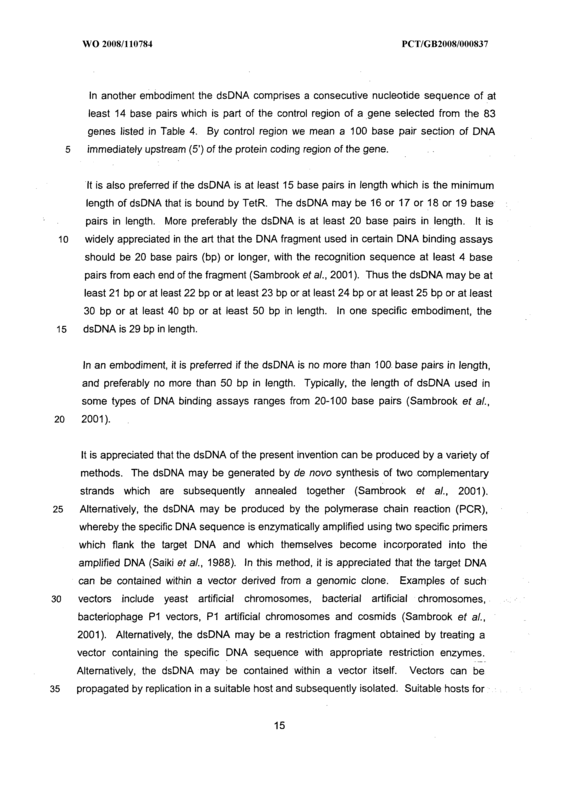 A method according to any of Claims 1-28 wherein the dsDNA is no more than 100 bases pairs in length. 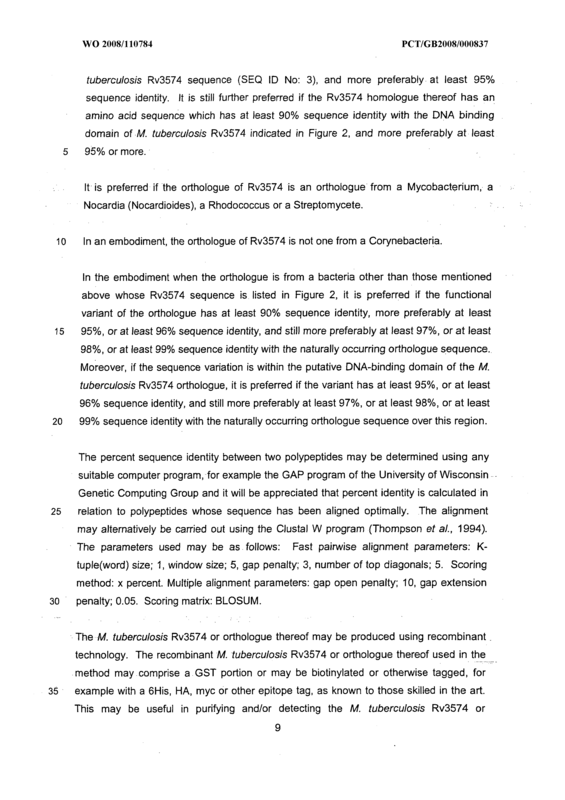 A method according to any of Claims 1-29 wherein the M. tuberculosis Rv3574 or orthologue thereof is provided bound to the dsDNA. 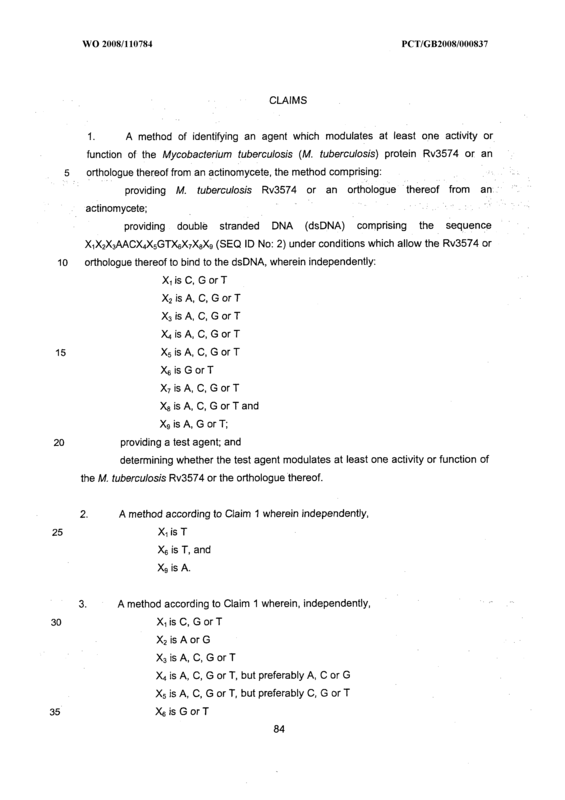 A method according to any of Claims 1-29 wherein the test agent and the dsDNA are provided before the M. tuberculosis Rv3574 or the orthologue thereof. 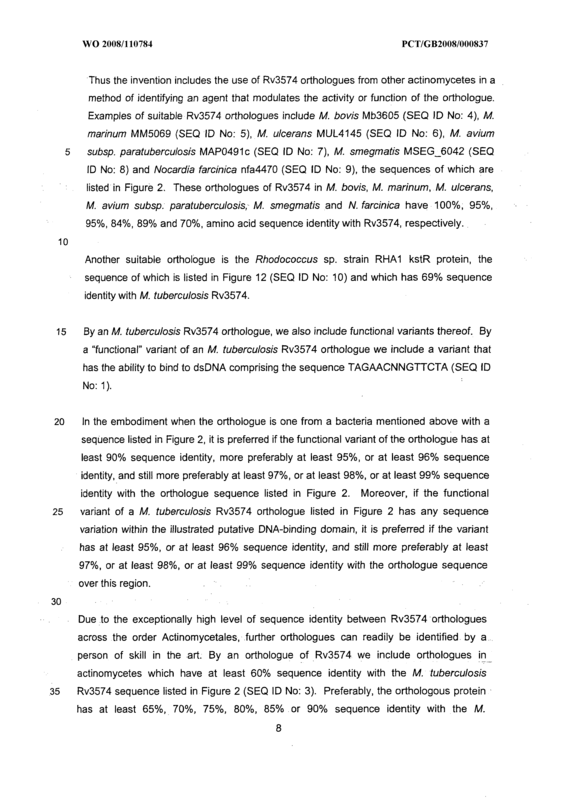 A method according to any of Claims 1-29 wherein the M. tuberculosis Rv3574 or the orthologue thereof and the dsDNA are provided before the test agent. 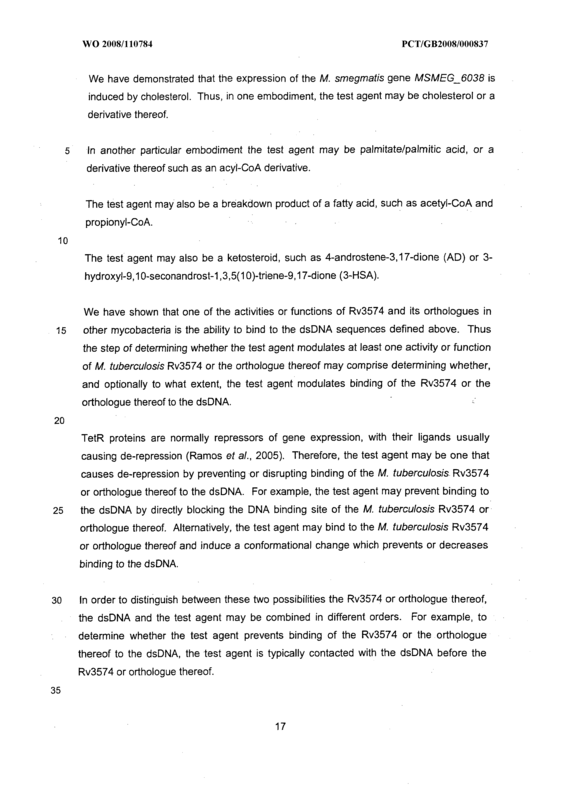 A method according to any of Claims 1-32 wherein the test agent is a lipid. 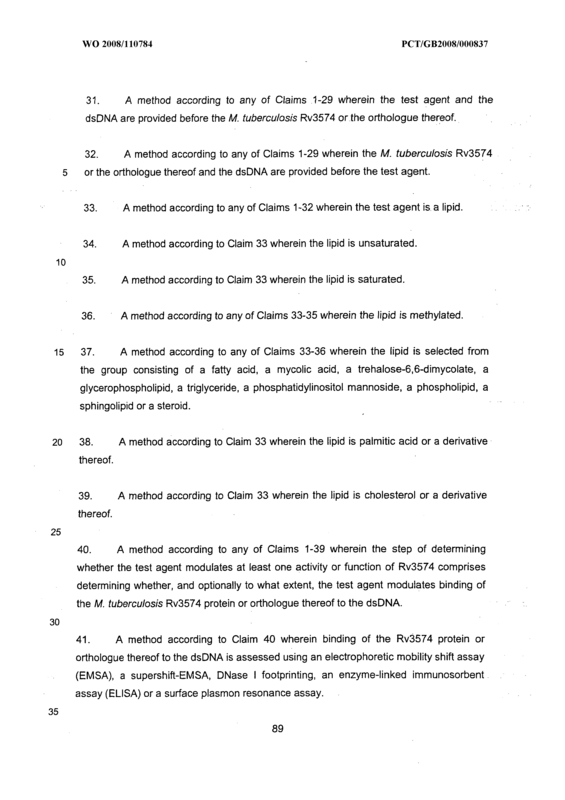 A method according to Claim 33 wherein the lipid is unsaturated. 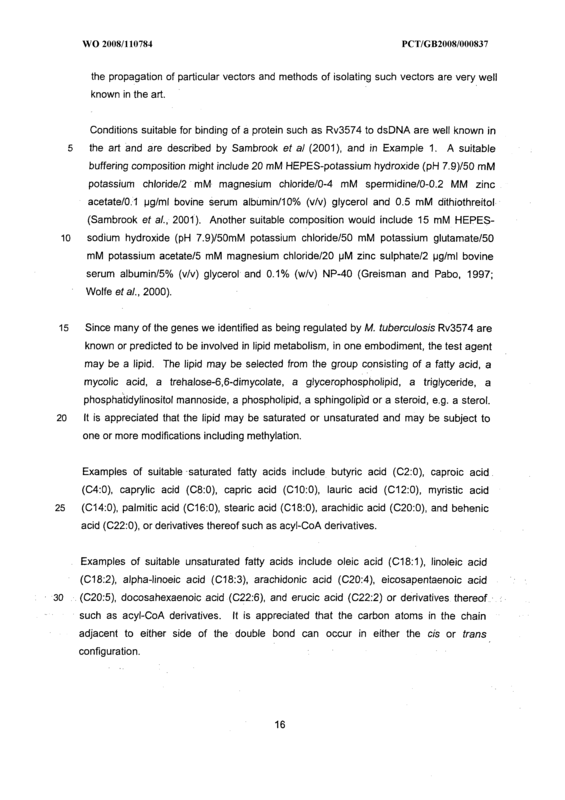 A method according to Claim 33 wherein the lipid is saturated. 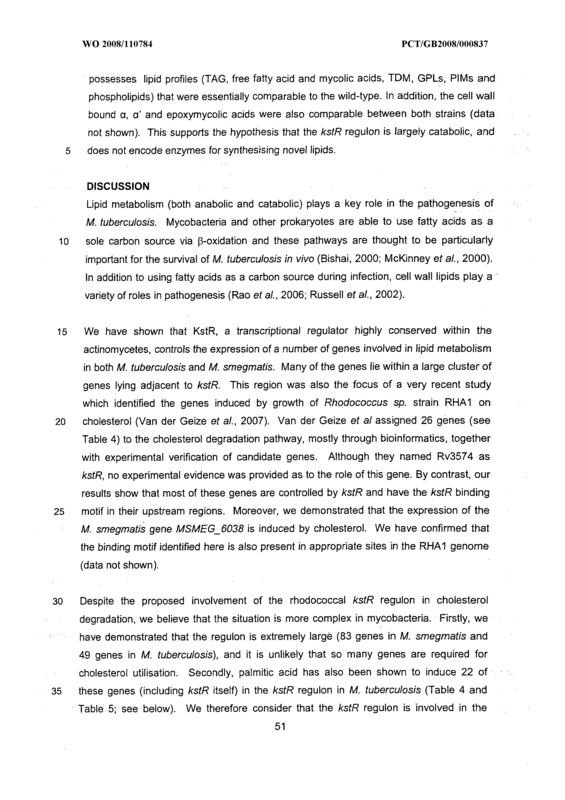 A method according to any of Claims 33-35 wherein the lipid is methylated. 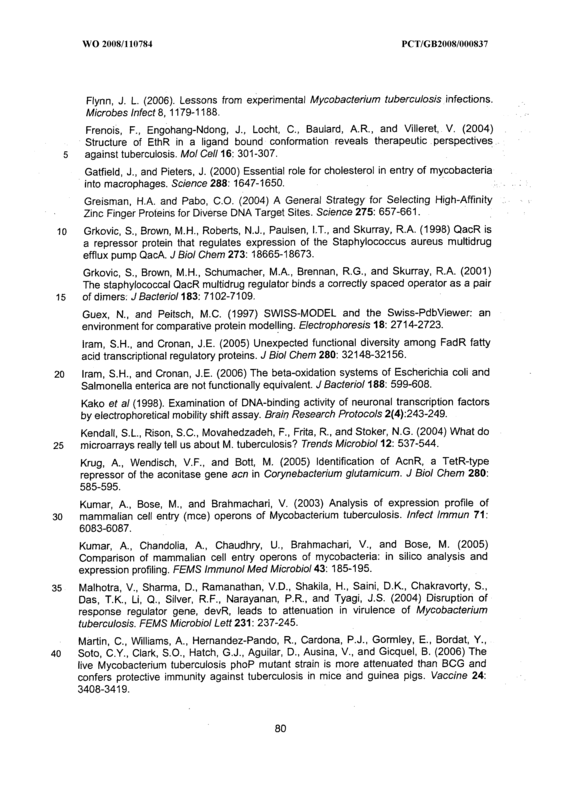 A method according to any of Claims 33-36 wherein the lipid is selected from the group consisting of a fatty acid, a mycolic acid, a trehalose-6,6-dimycolate, a glycerophospholipid, a triglyceride, a phosphatidylinositol mannoside, a phospholipid, a sphingolipid or a steroid. 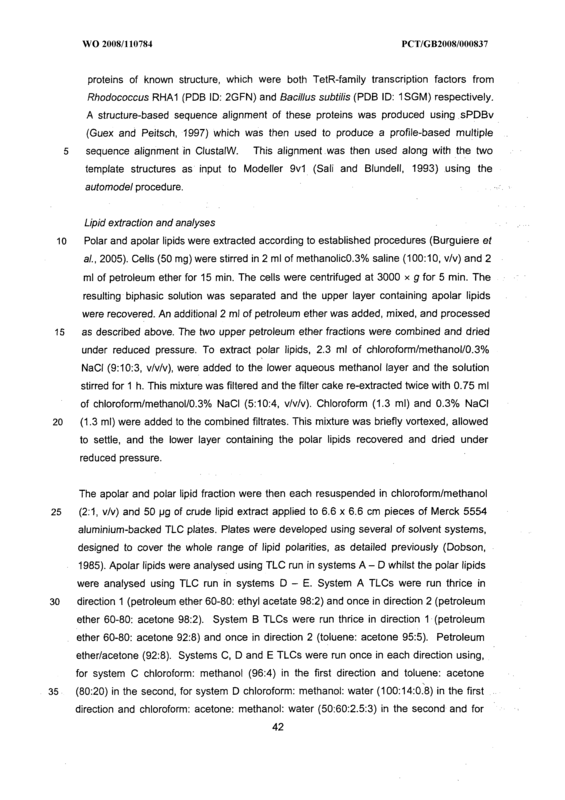 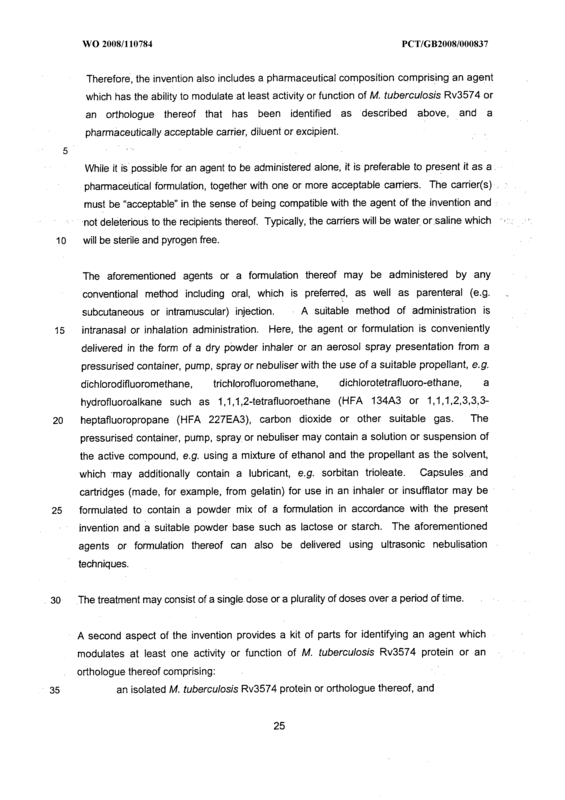 A method according to Claim 33 wherein the lipid is palmitic acid or a derivative thereof. 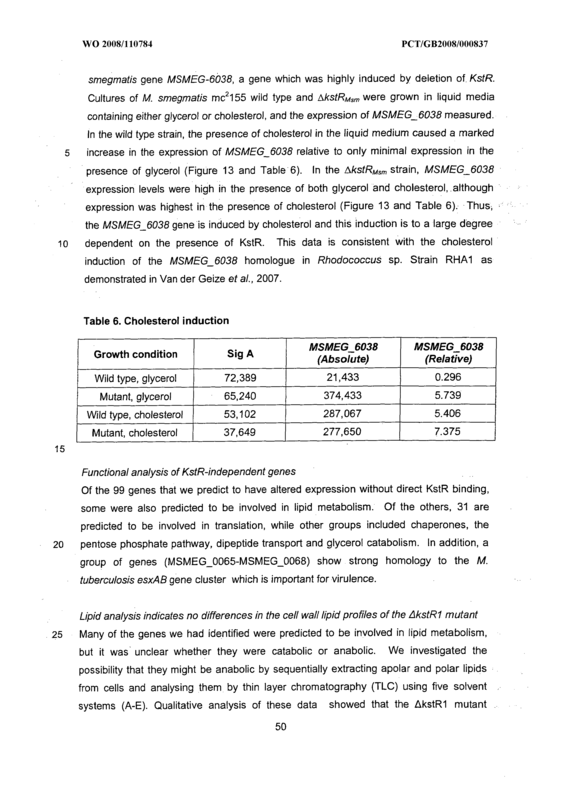 A method according to Claim 33 wherein the lipid is cholesterol or a derivative thereof. 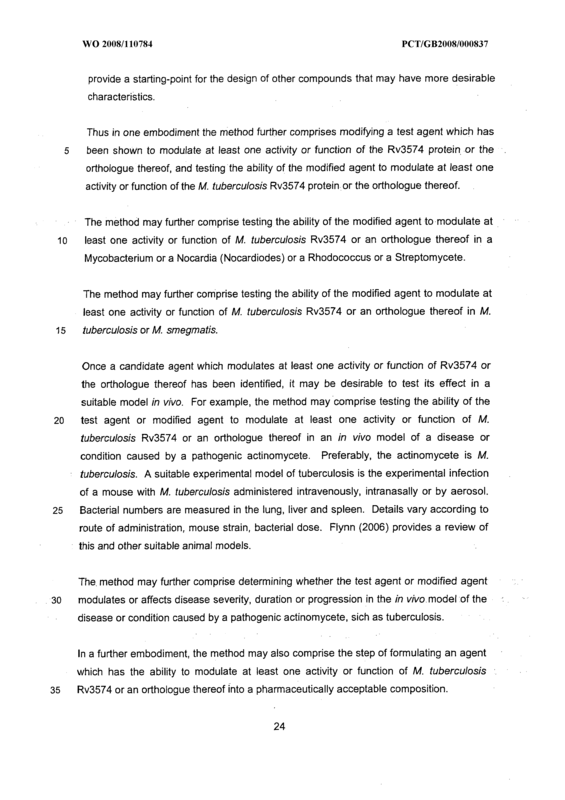 A method according to any of Claims 1-39 wherein the step of determining whether the test agent modulates at least one activity or function of Rv3574 comprises determining whether, and optionally to what extent, the test agent modulates binding of the M. tuberculosis Rv3574 protein or orthologue thereof to the dsDNA. 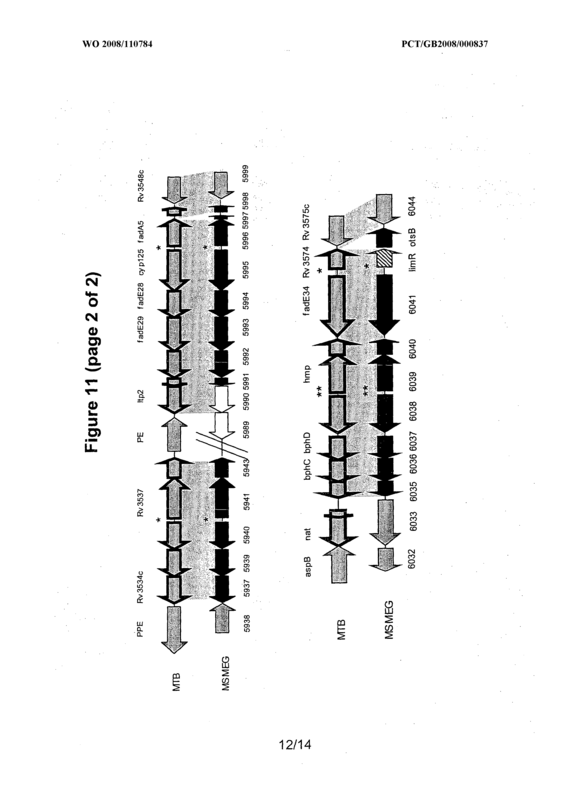 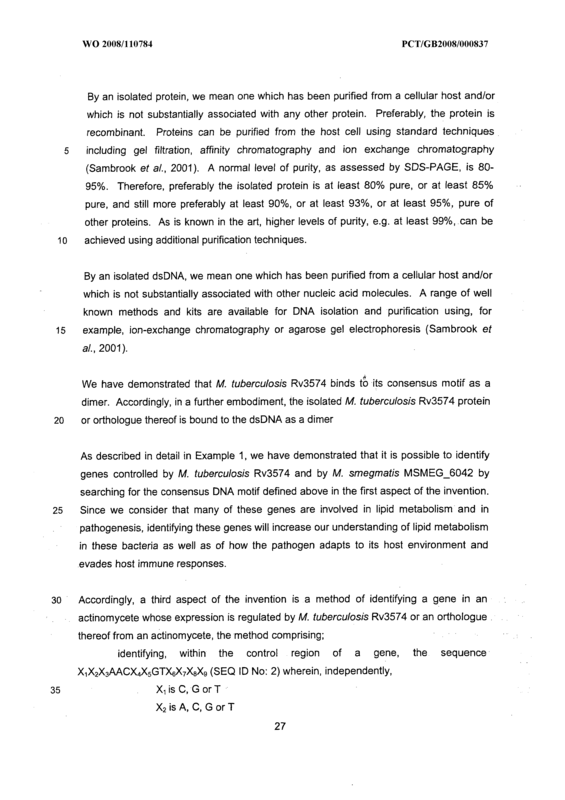 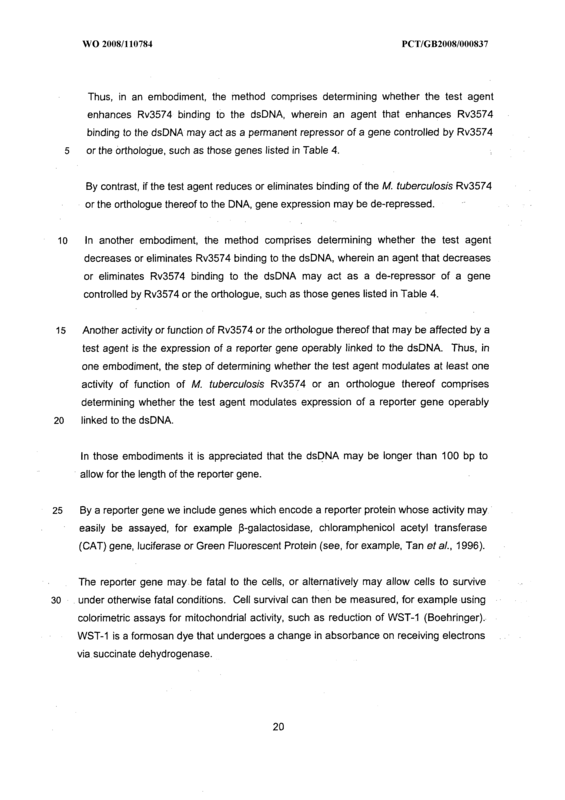 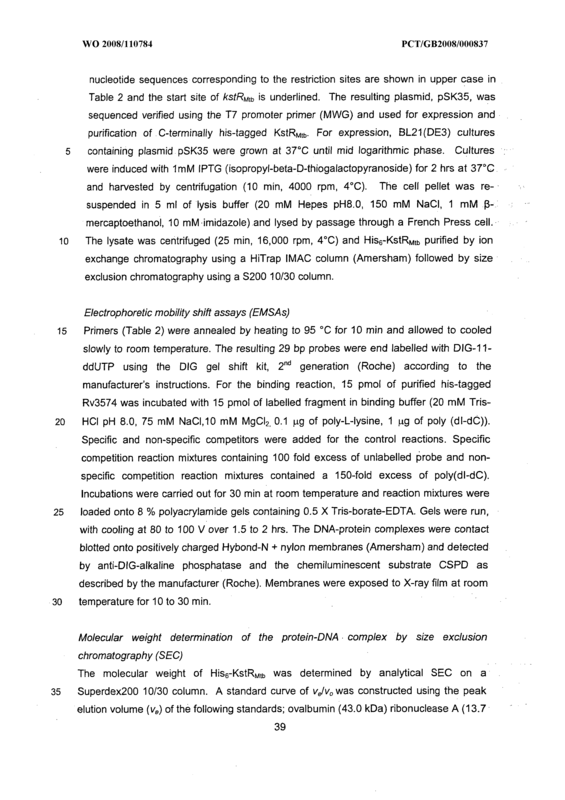 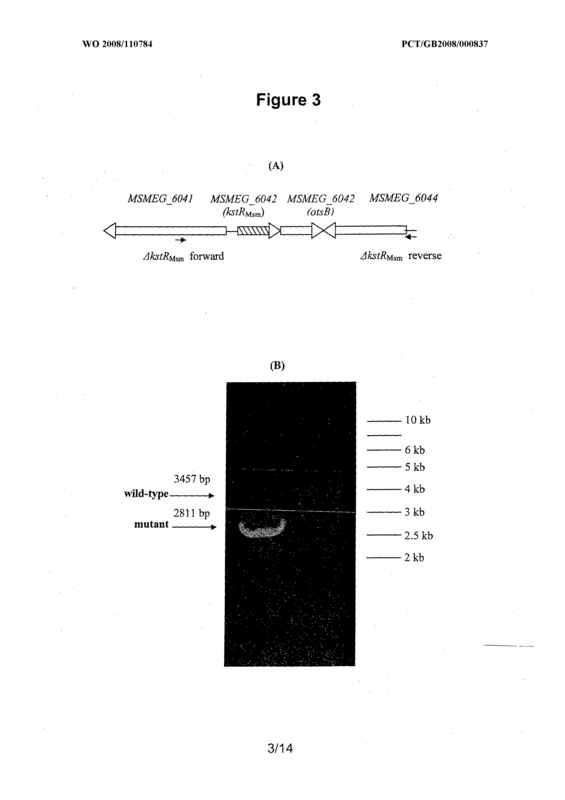 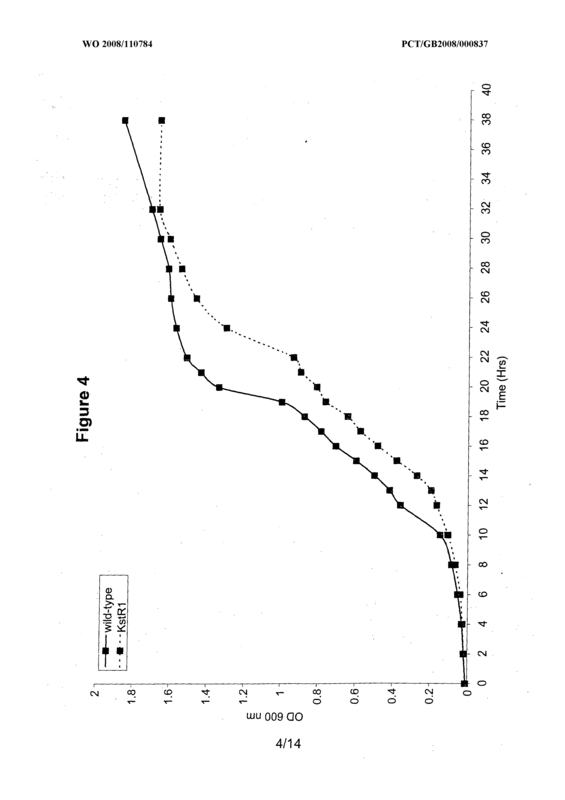 A method according to Claim 40 wherein binding of the Rv3574 protein or orthologue thereof to the dsDNA is assessed using an electrophoretic mobility shift assay (EMSA), a supershift-EMSA, DNase I footprinting, an enzyme-linked immunosorbent assay (ELISA) or a surface plasmon resonance assay. 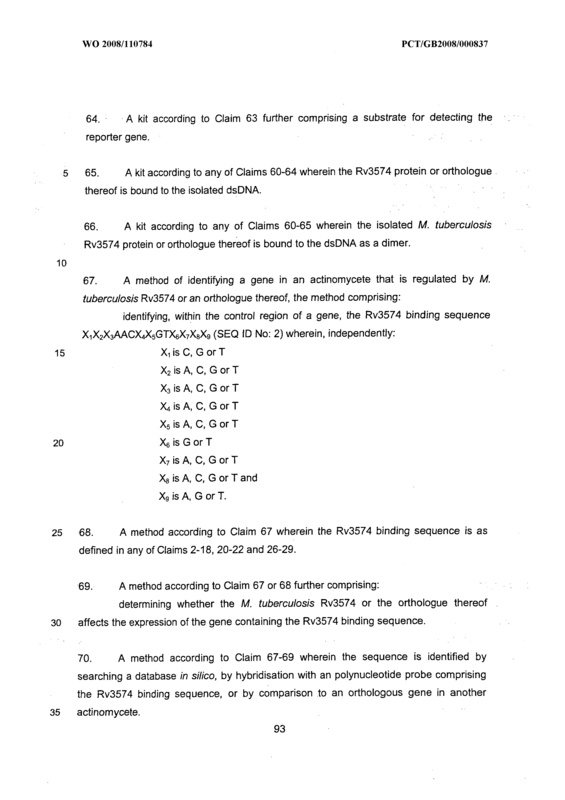 A method according to Claim 40 or 41 comprising determining whether the test agent enhances binding of the Rv3574 protein or the orthologue thereof to the dsDNA, wherein an agent that enhances Rv3574 binding to the dsDNA may act as a permanent repressor of a gene controlled by M. tuberculosis Rv3574 or an orthologue thereof such as those listed in Table 4 or Table 5. 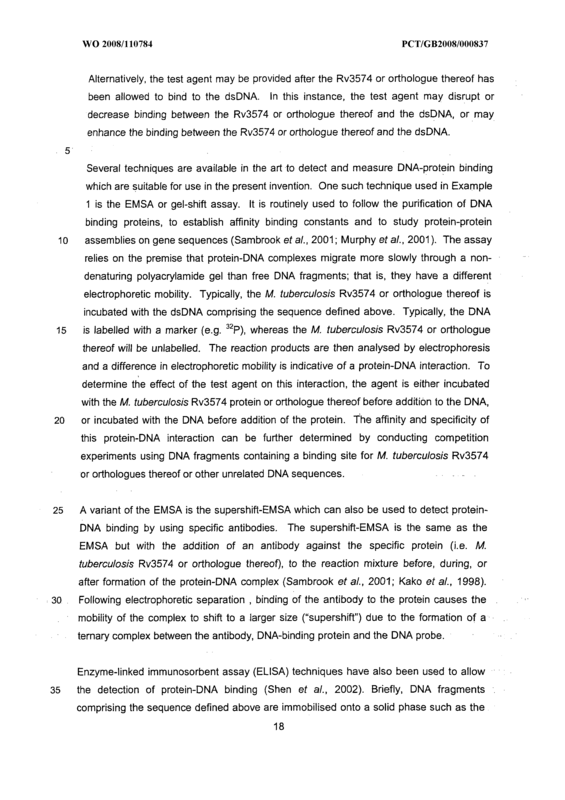 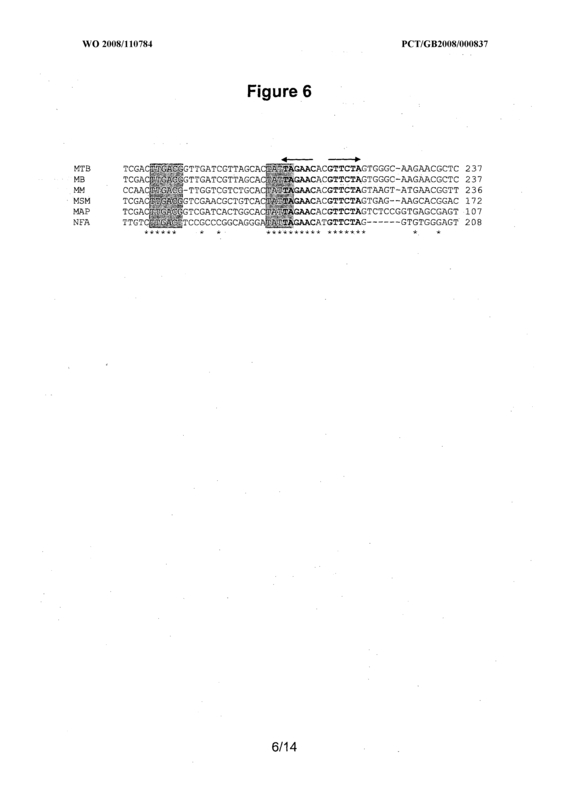 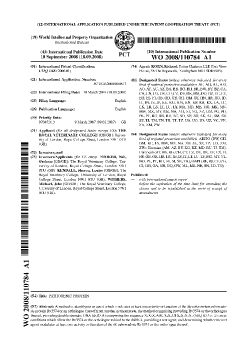 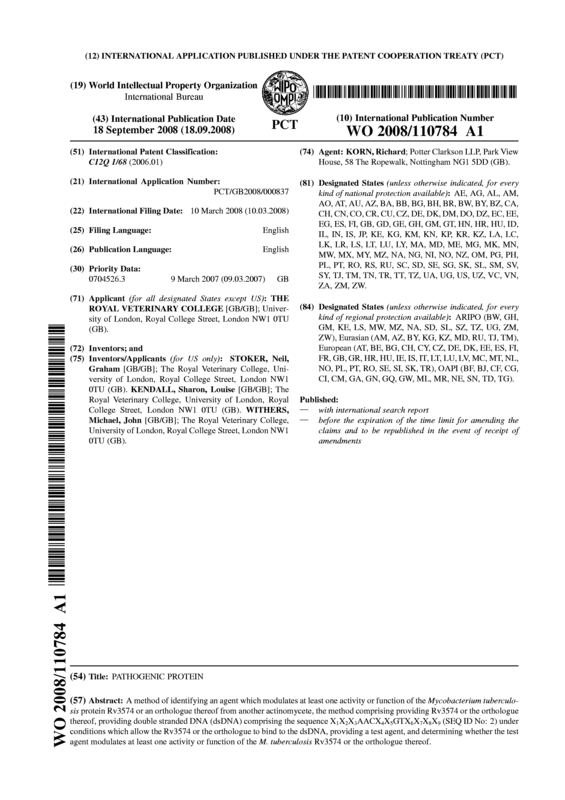 A method according to Claim 40 or 41 comprising determining whether the test agent decreases or prevents binding of the Rv3574 protein or orthologue thereof to the dsDNA, wherein an agent that decreases or prevents Rv3574 binding to the dsDNA may act as a de-repressor of a gene controlled by M. tuberculosis Rv3574 or an orthologue thereof such as those listed in Table 4 or Table 5. 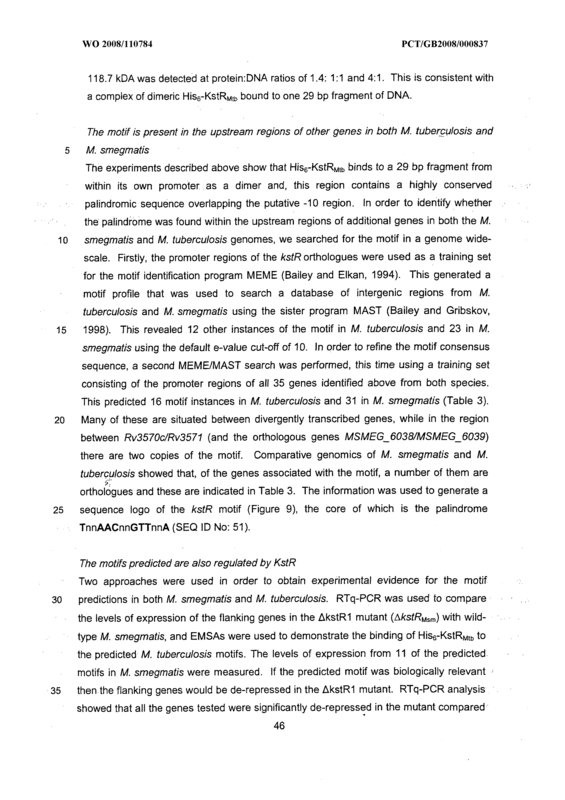 A method according to any of Claims 1-39 wherein the step of determining whether the test agent modulates at least one activity or function of the M. tuberculosis Rv3574 protein or an orthologue thereof comprises measuring the expression of a reporter gene operably linked to the dsDNA. 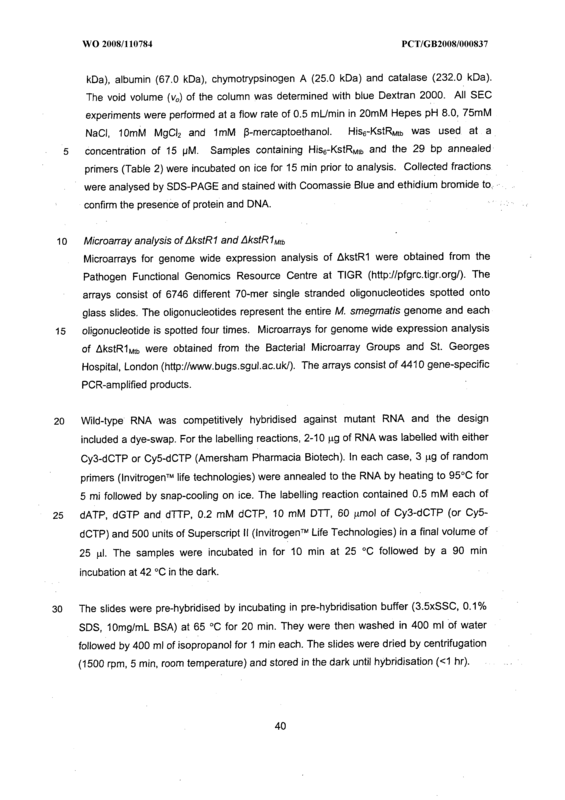 A method according to Claim 44 wherein the reporter gene is selected from a gene encoding chloramphenicol acetyl transferase (CAT), luciferase, β-galactosidase or Green Fluorescent Protein (GFP). 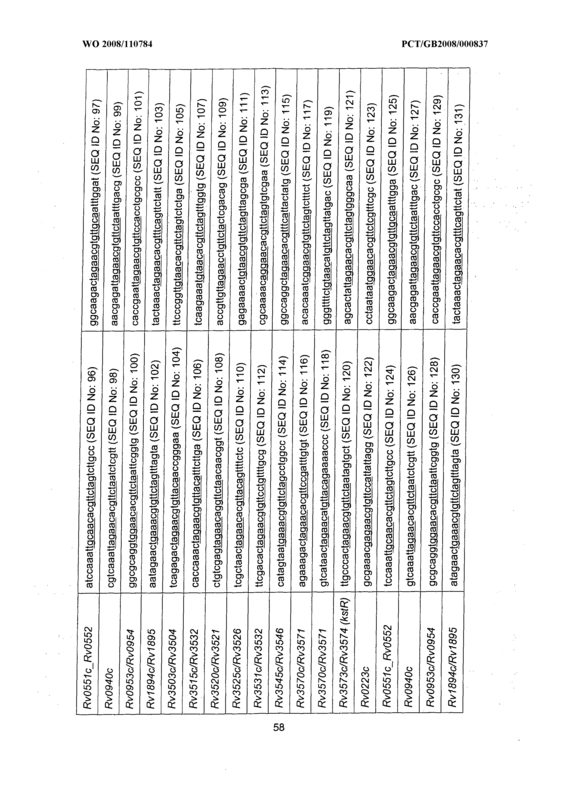 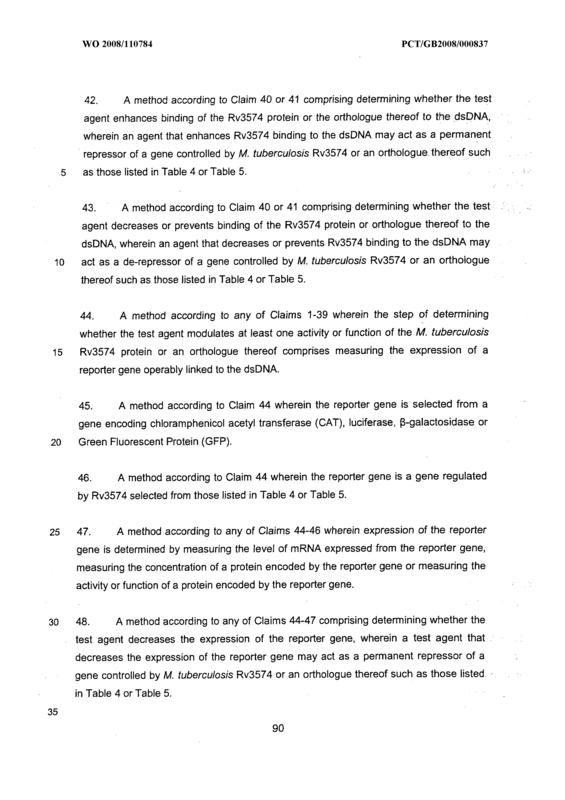 A method according to Claim 44 wherein the reporter gene is a gene regulated by Rv3574 selected from those listed in Table 4 or Table 5. 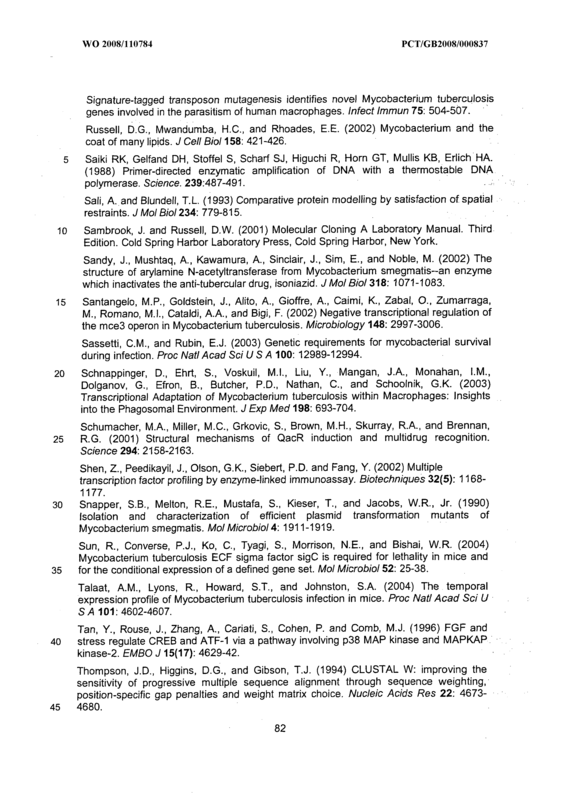 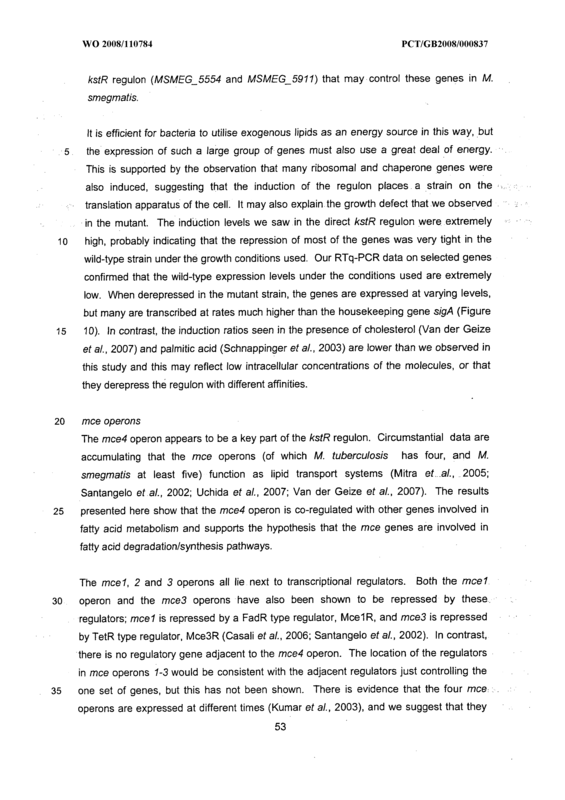 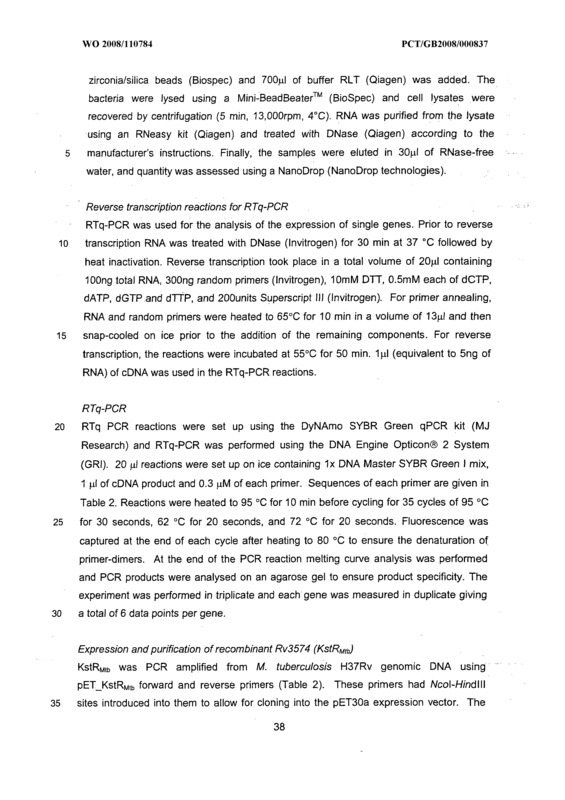 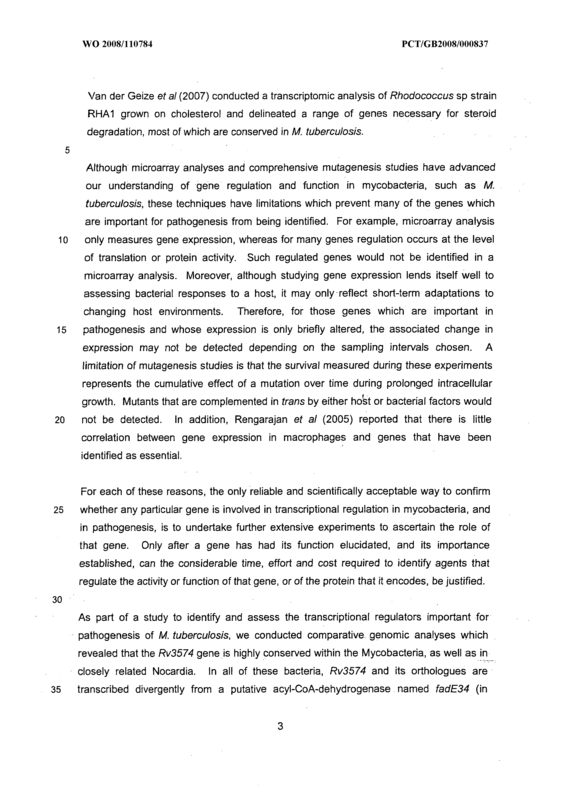 A method according to any of Claims 44-46 wherein expression of the reporter gene is determined by measuring the level of mRNA expressed from the reporter gene, measuring the concentration of a protein encoded by the reporter gene or measuring the activity or function of a protein encoded by the reporter gene. 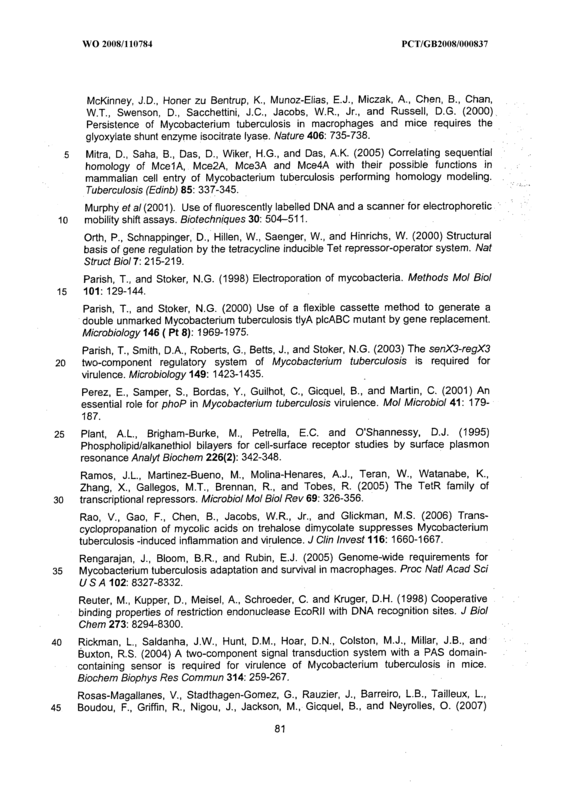 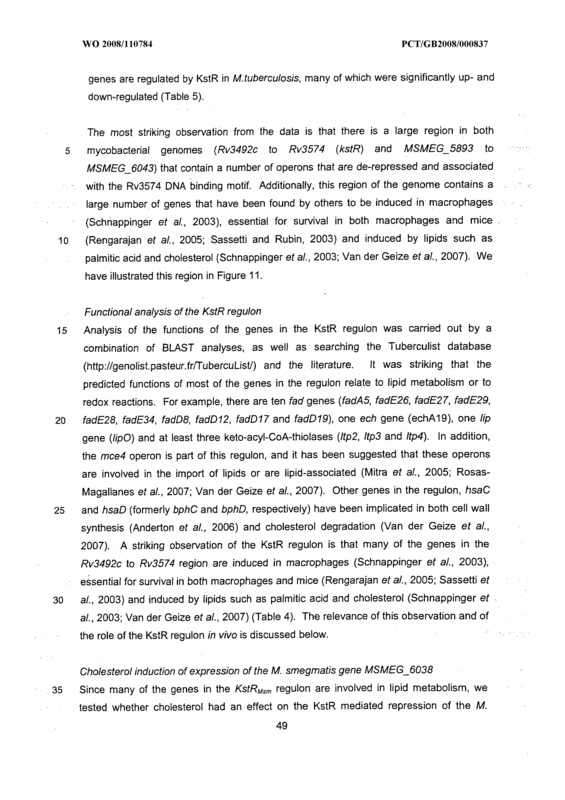 A method according to any of Claims 44-47 comprising determining whether the test agent decreases the expression of the reporter gene, wherein a test agent that decreases the expression of the reporter gene may act as a permanent repressor of a gene controlled by M. tuberculosis Rv3574 or an orthologue thereof such as those listed ■ in Table 4 or Table 5. 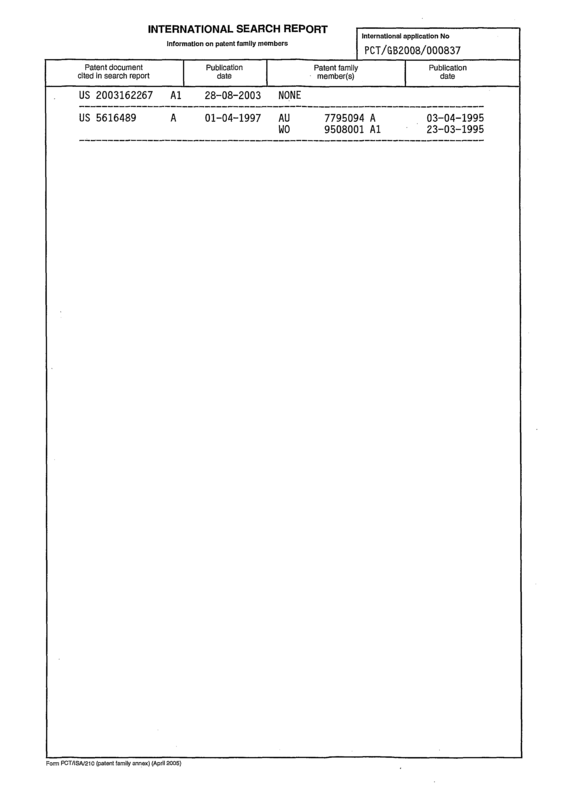 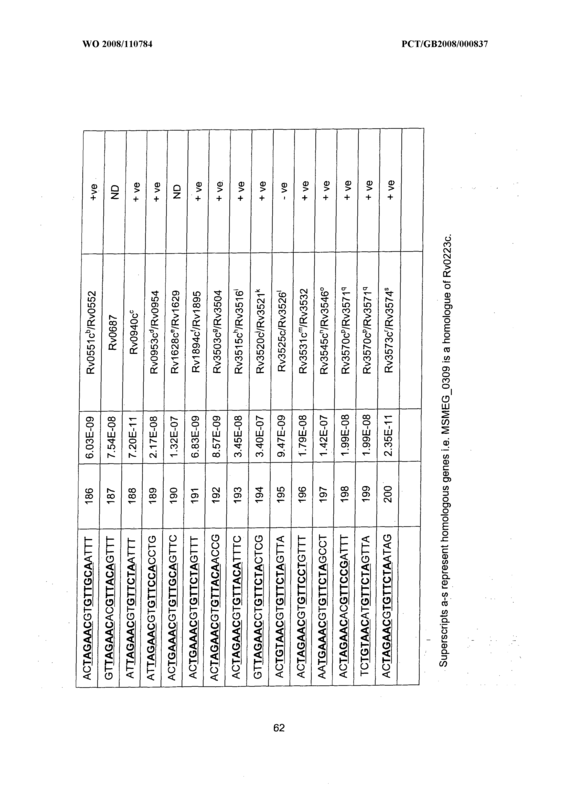 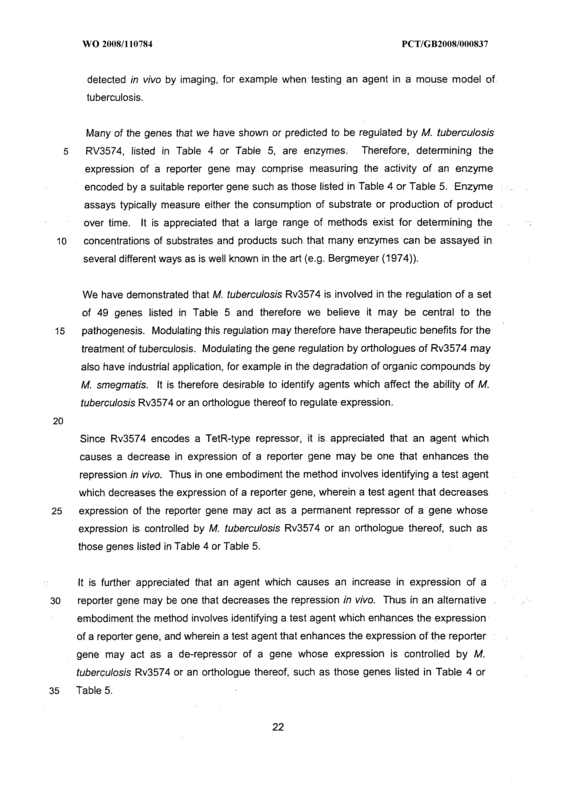 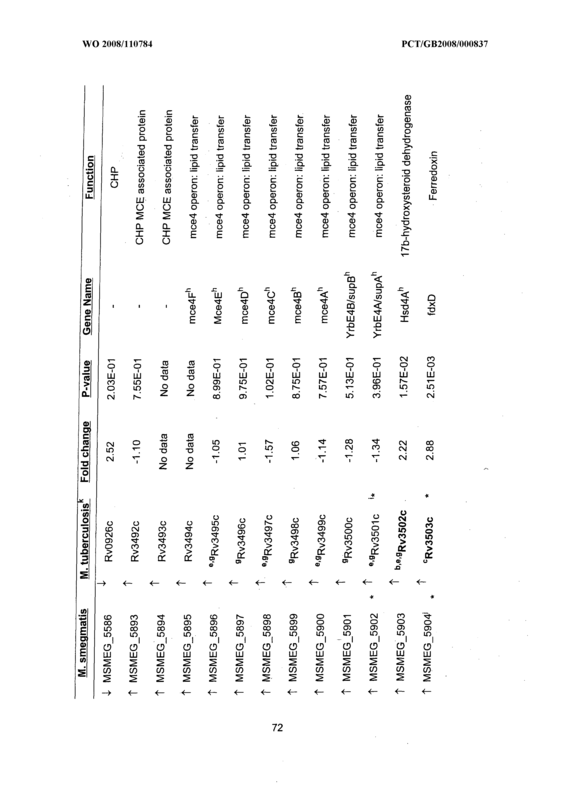 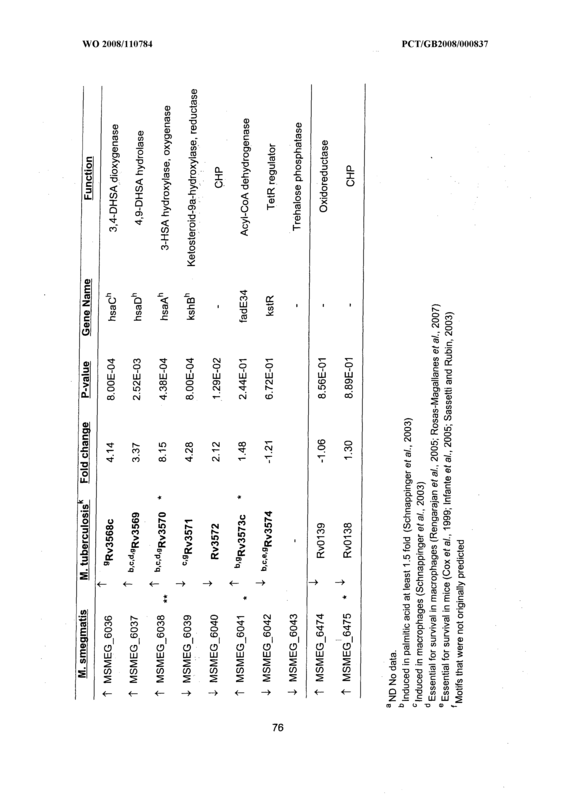 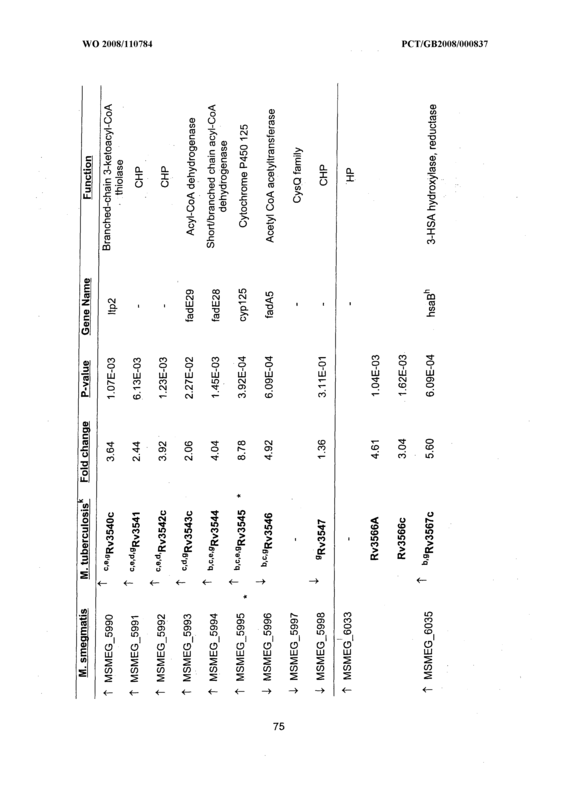 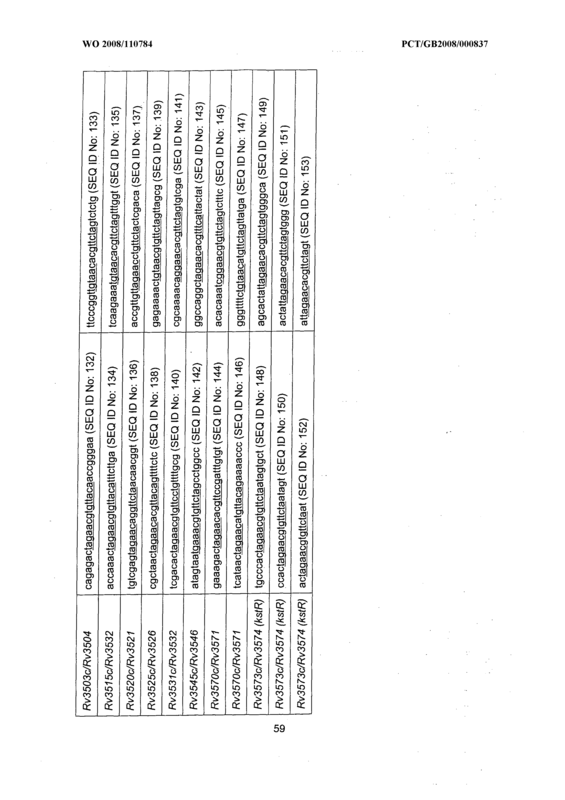 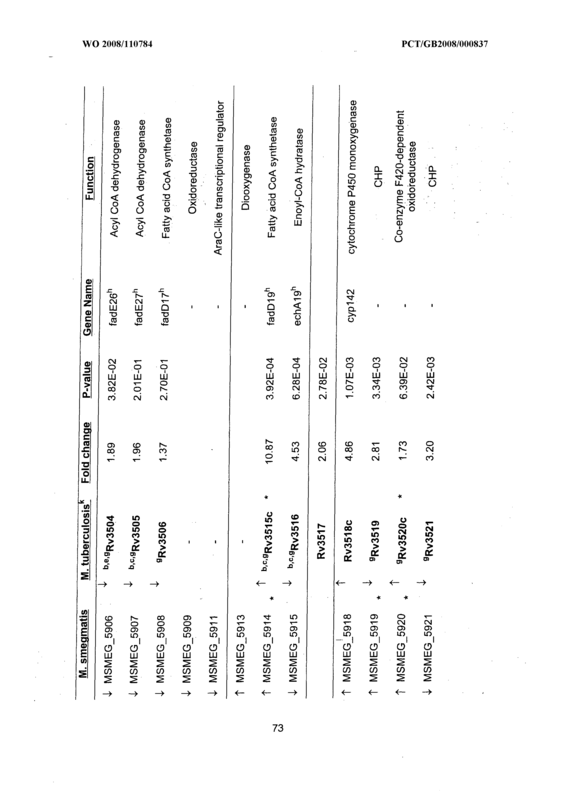 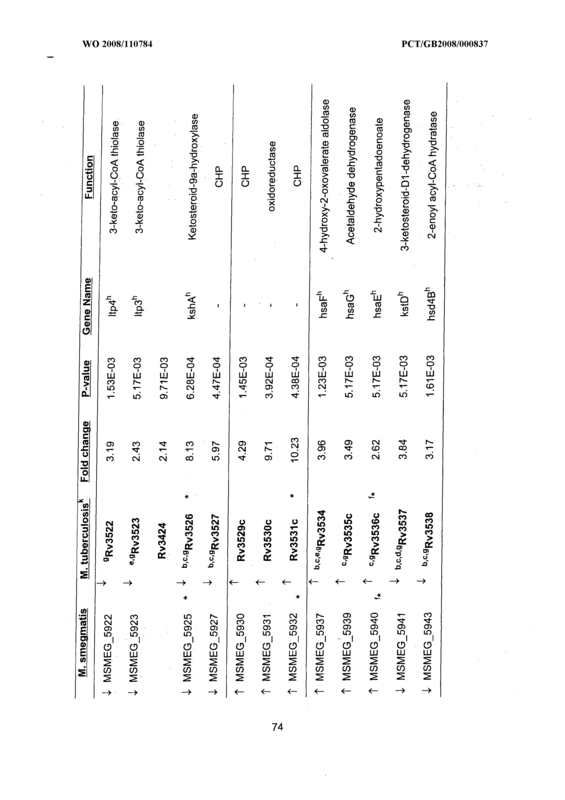 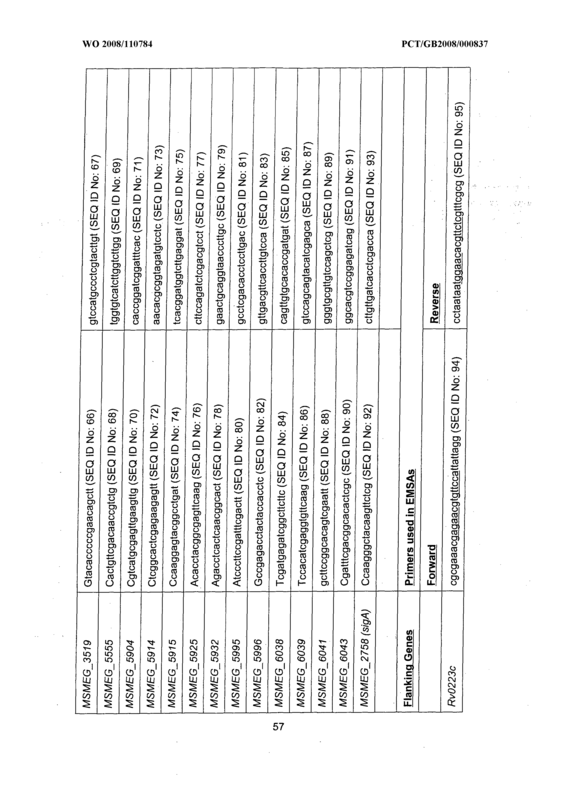 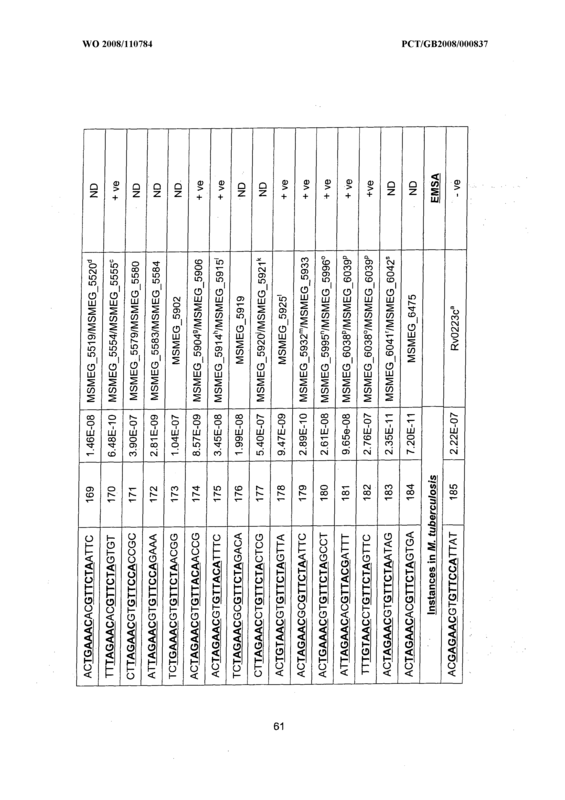 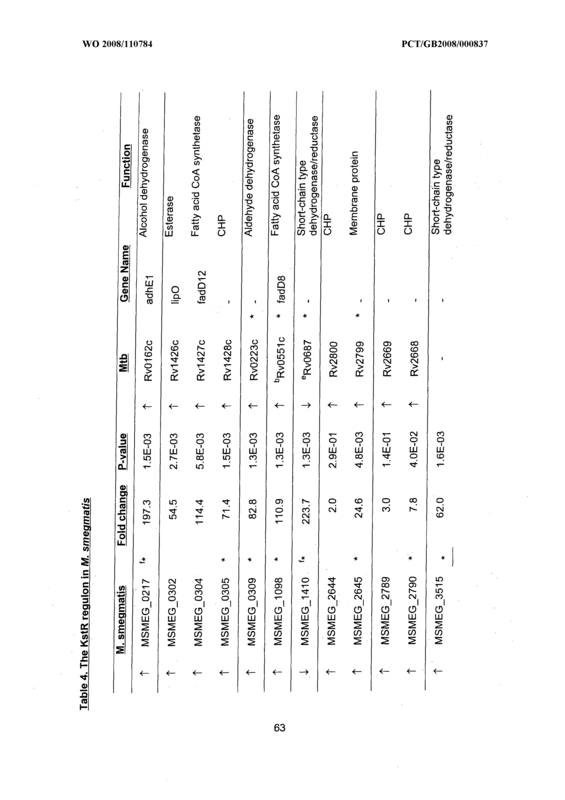 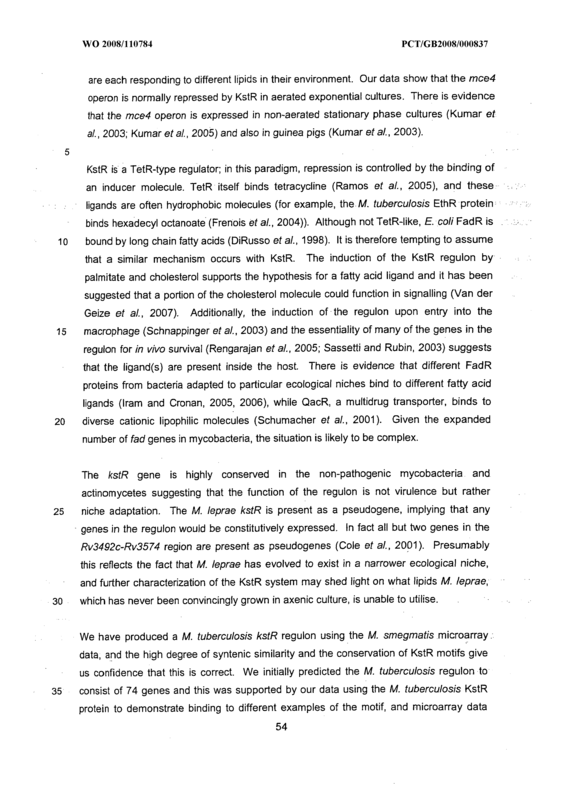 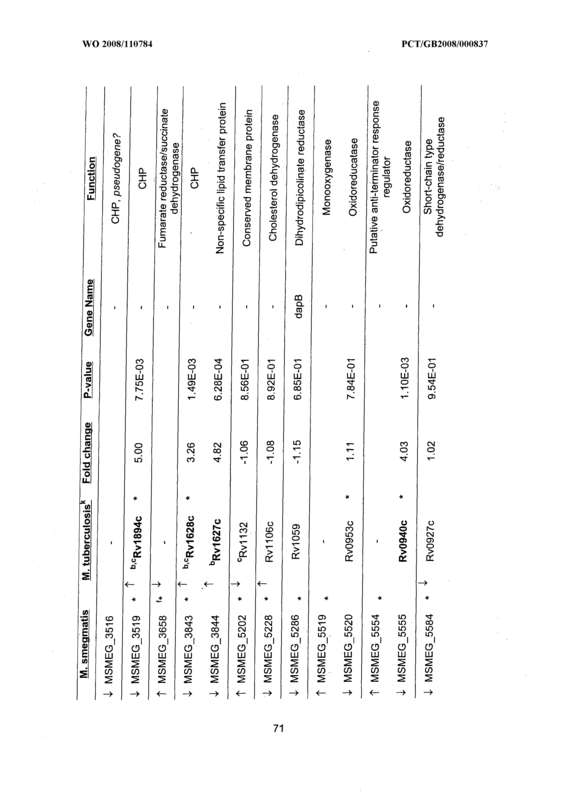 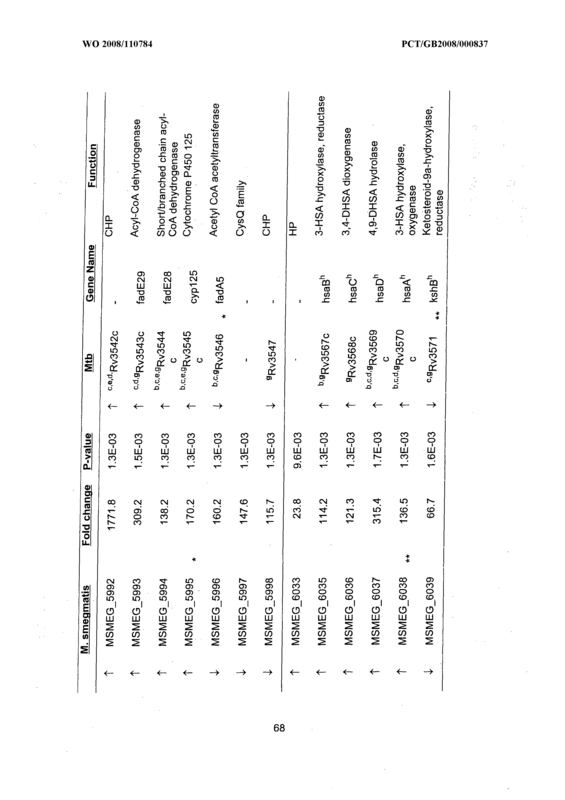 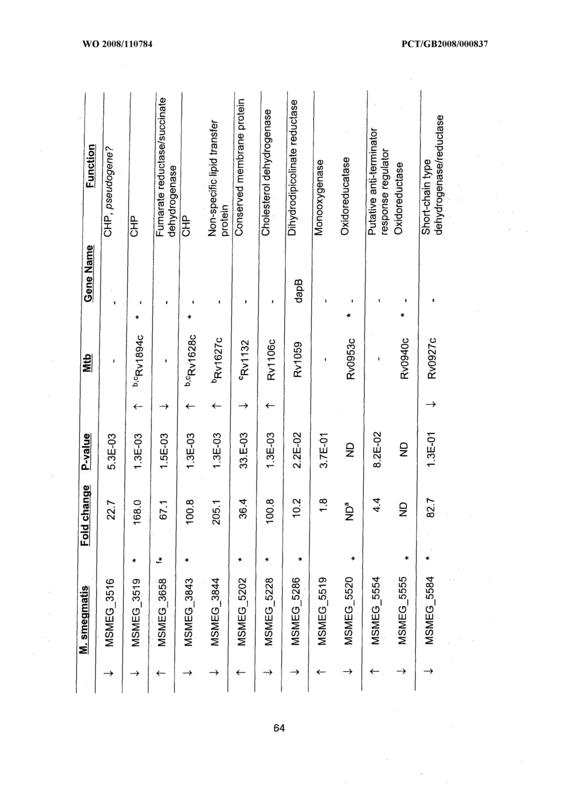 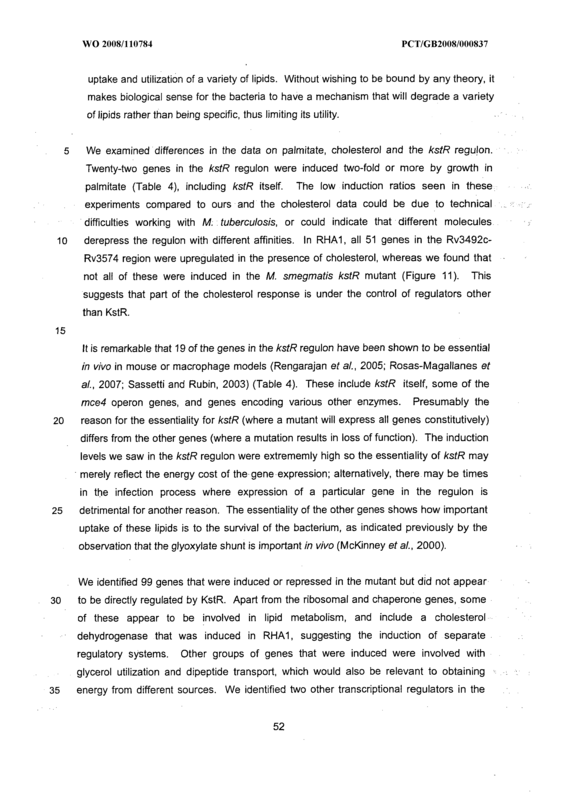 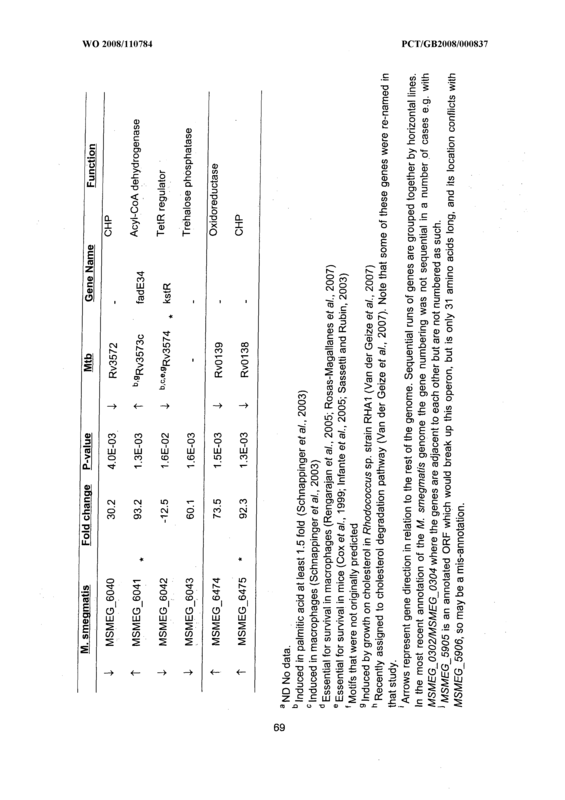 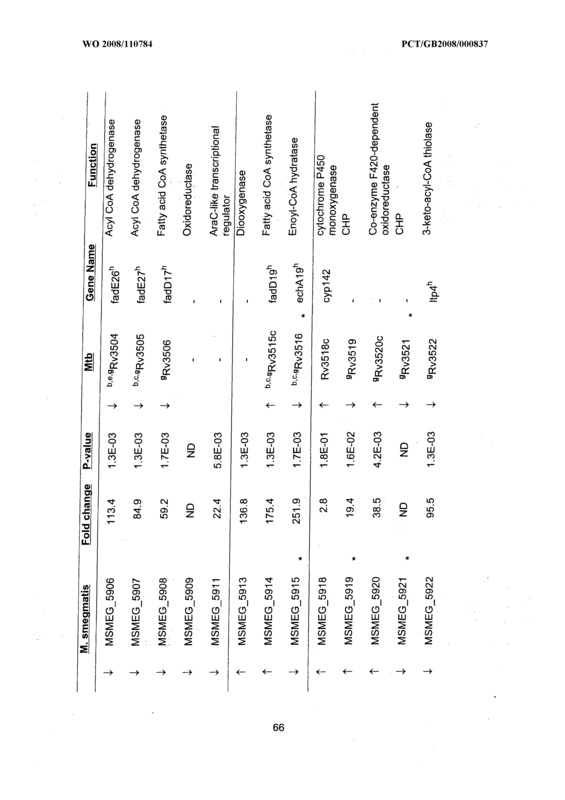 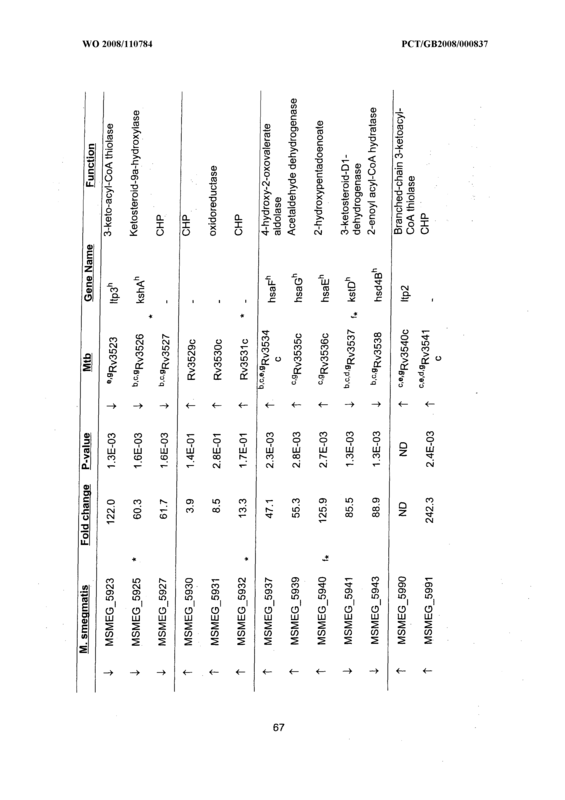 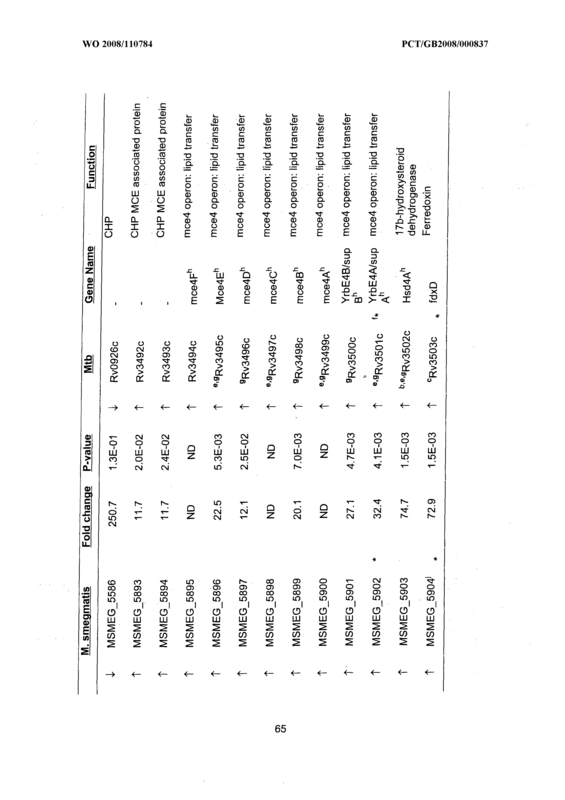 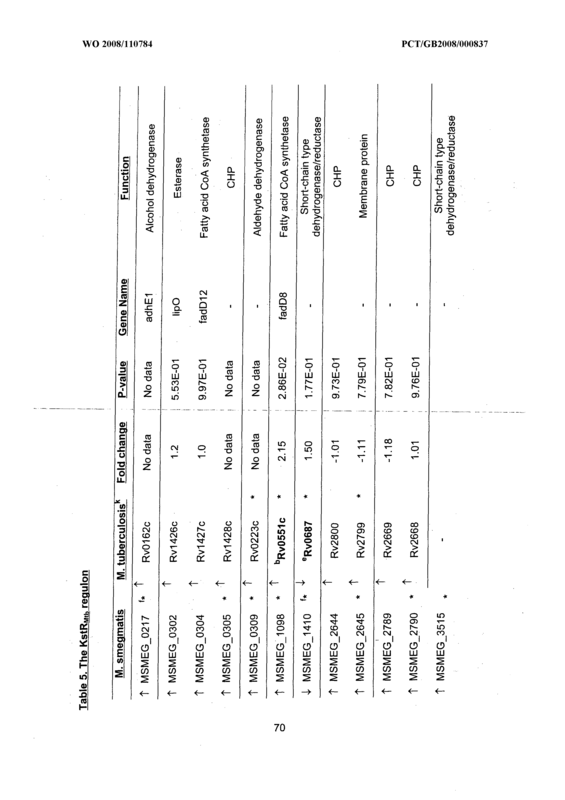 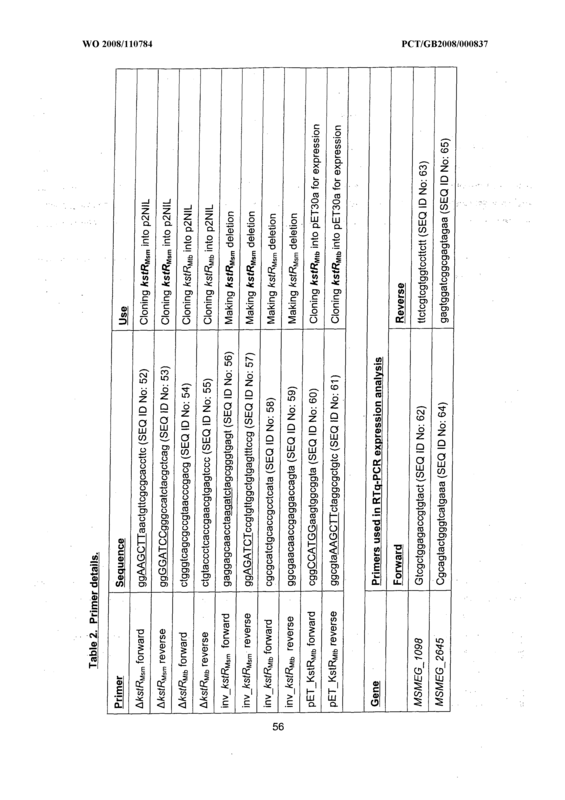 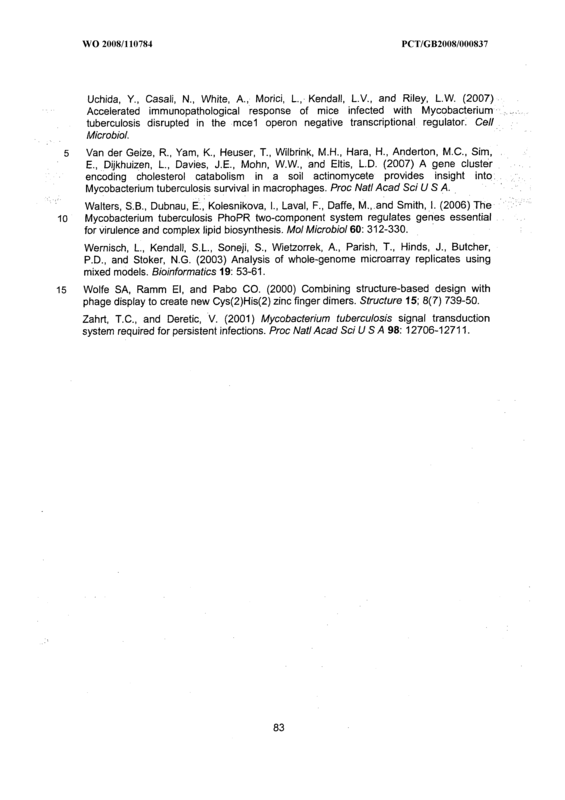 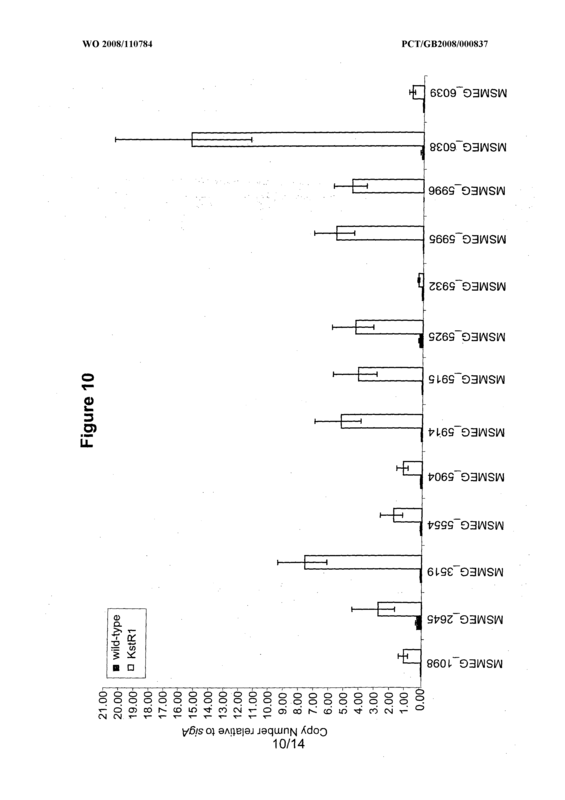 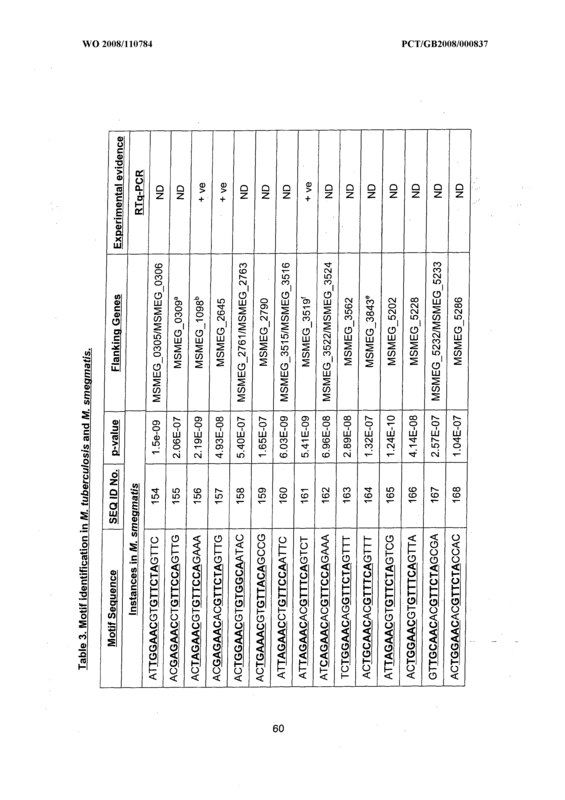 A method according to any of Claims 44-47 comprising determining whether the test agent increases the expression of the reporter gene, wherein a test agent that increases the expression of the reporter gene may act as a de-repressor of a gene controlled by M. tuberculosis Rv3574 or an orthologue thereof such as those listed in Table 4 or Table 5. 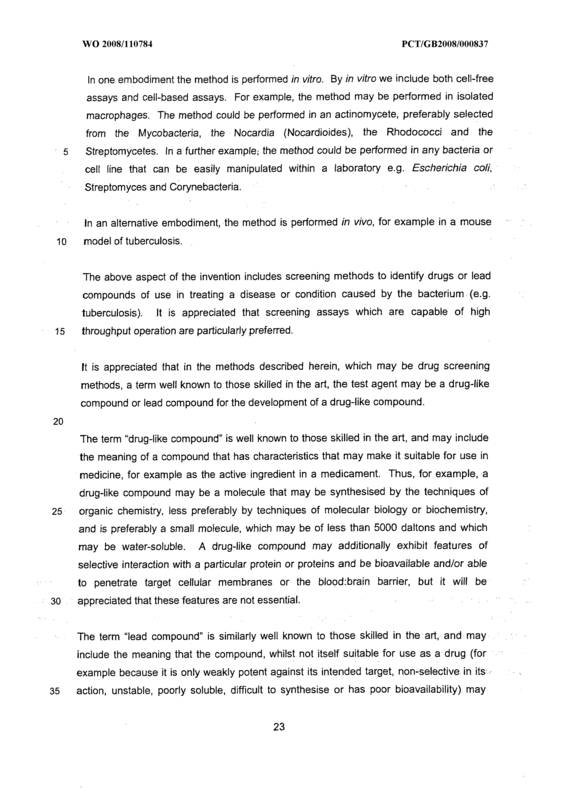 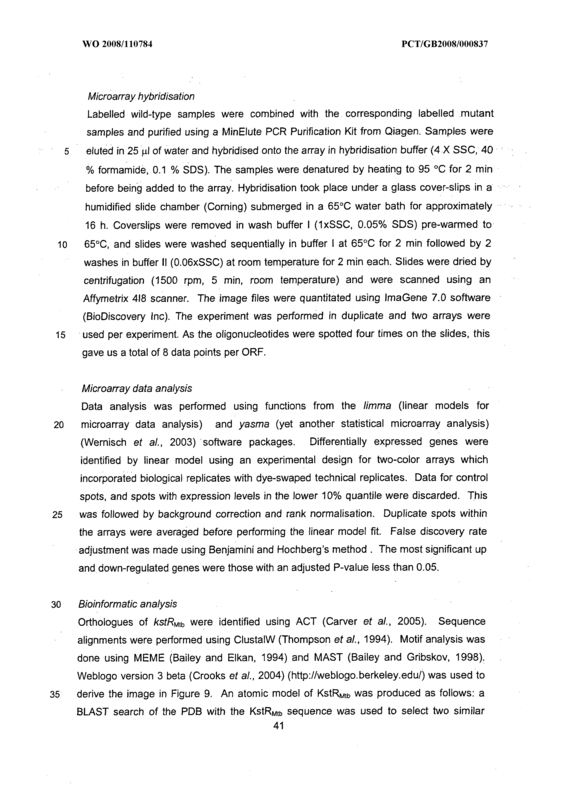 A method according to any of Claims 1-49 wherein the method is performed in vitro. 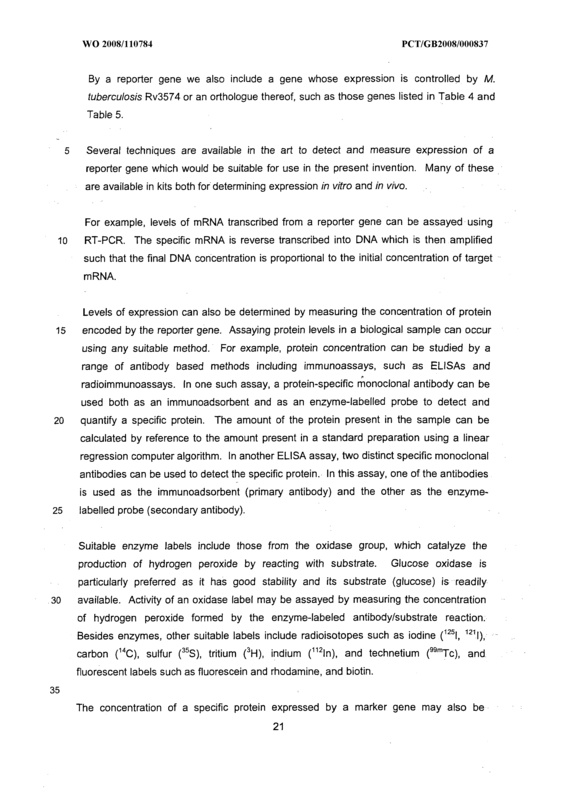 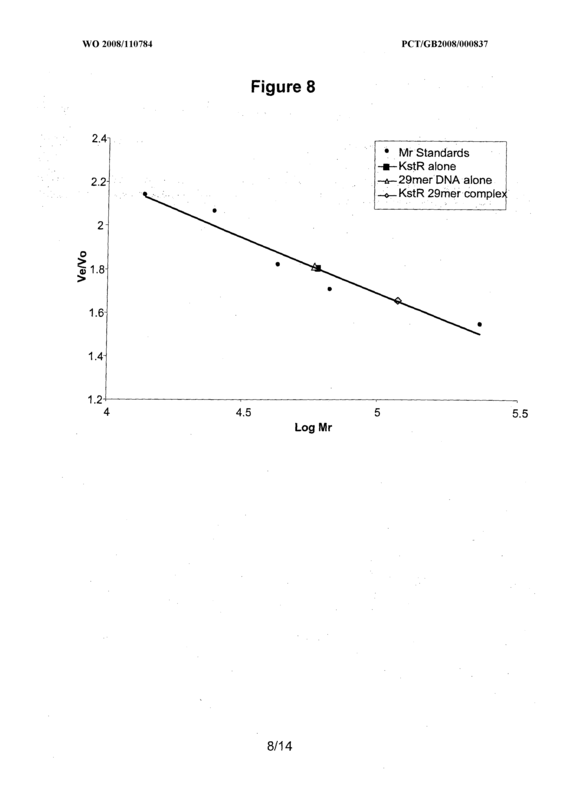 A method according to Claim 50 wherein the method is performed in a cell. 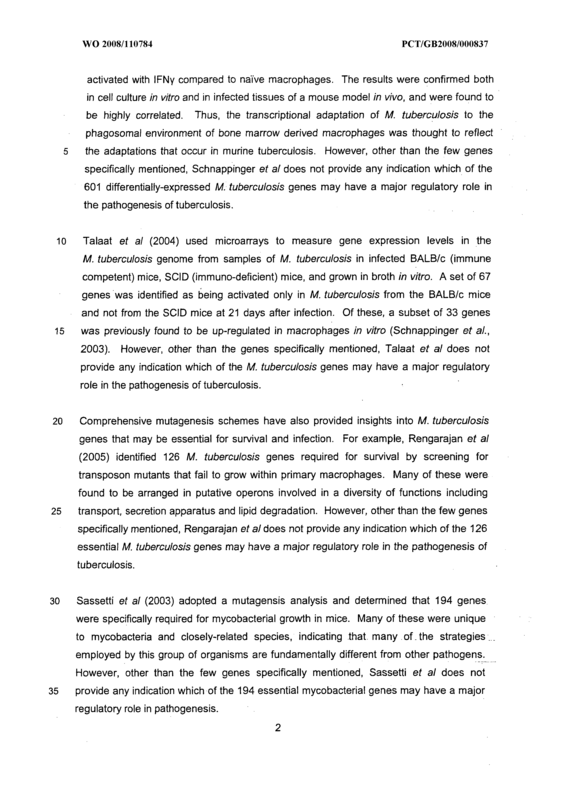 A method according to Claim 51 wherein the cell is selected from an actinomycete or a macrophage. 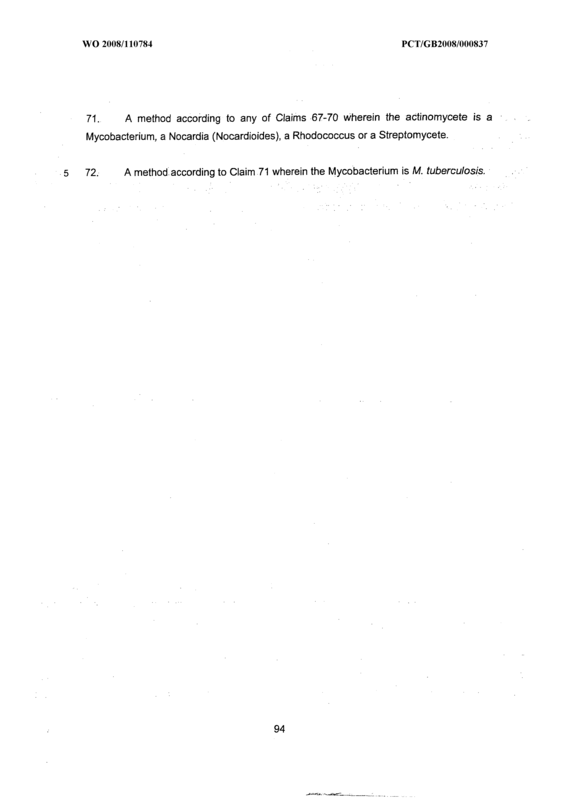 A method according to Claim 52 wherein the actinomycete is selected from the group consisting of a Mycobacterium, a Nocardia (Nocardioides), a Rhodococcus or a Streptomycete. 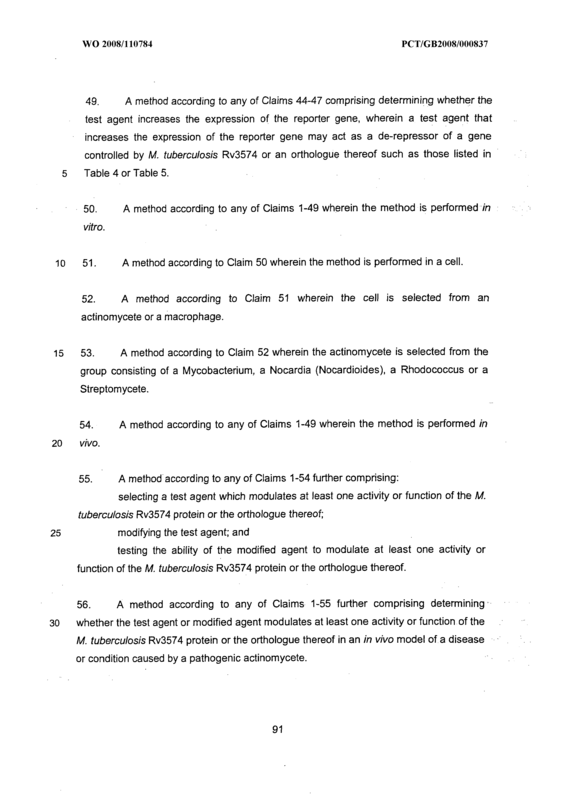 A method according to any of Claims 1-49 wherein the method is performed in vivo. 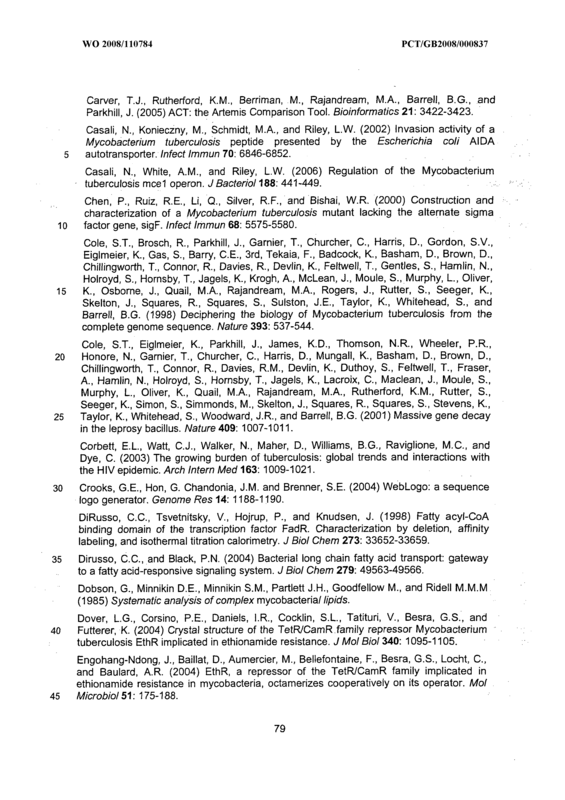 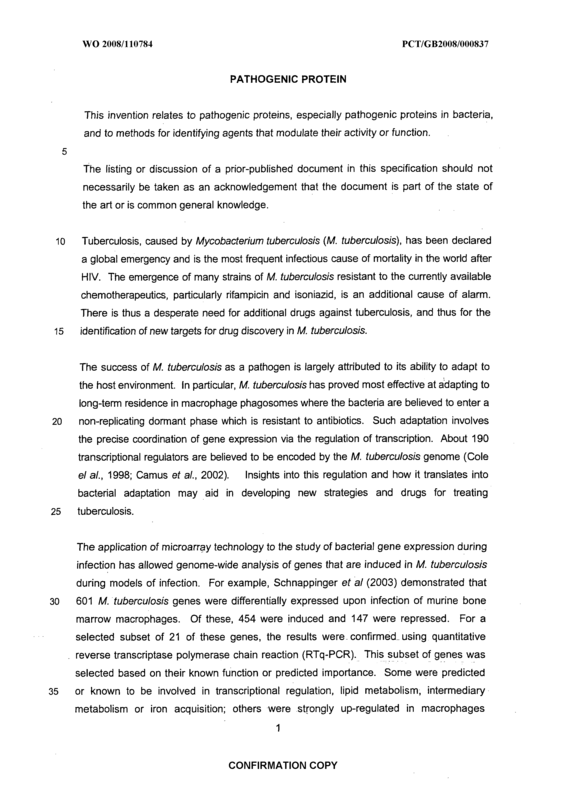 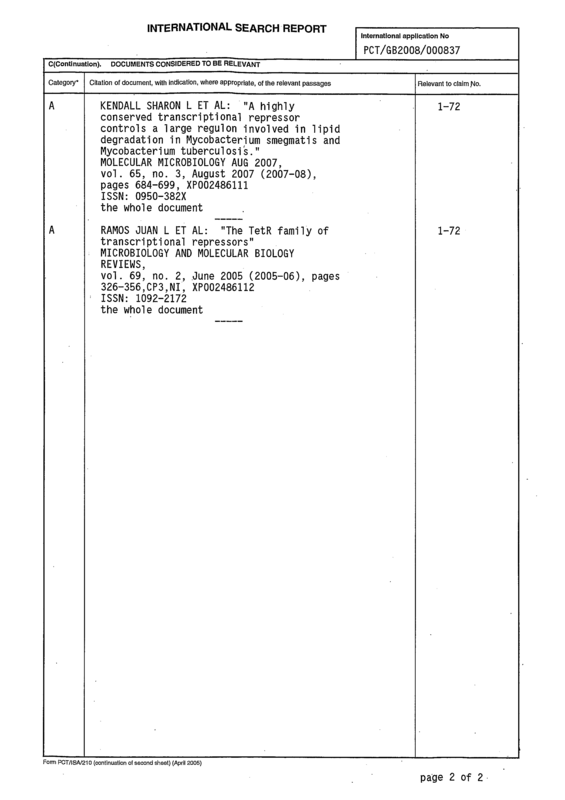 A method according to any of Claims 1-54 further comprising: selecting a test agent which modulates at least one activity or function of the M. tuberculosis Rv3574 protein or the orthologue thereof; modifying the test agent; and testing the ability of the modified agent to modulate at least one activity or function of the M. tuberculosis Rv3574 protein or the orthologue thereof. 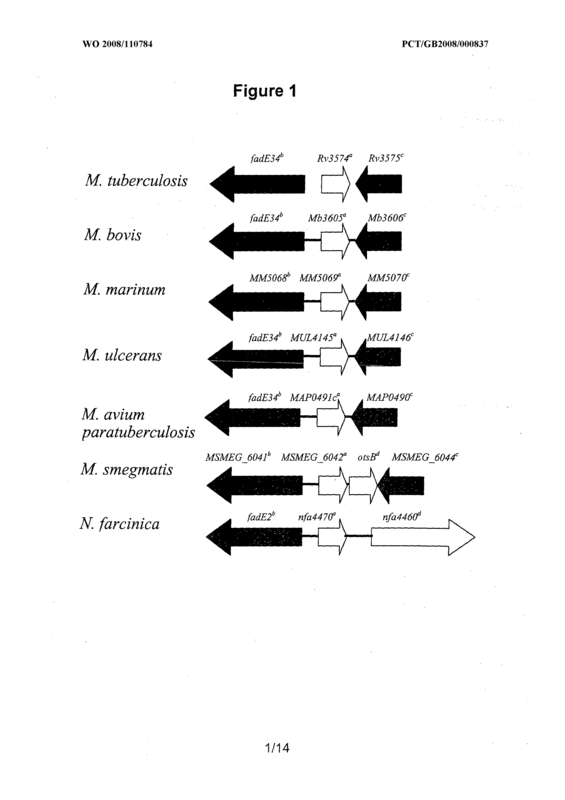 M. tuberculosis Rv3574 protein or the orthologue thereof in an in vivo model of a disease or condition caused by a pathogenic actinomycete. 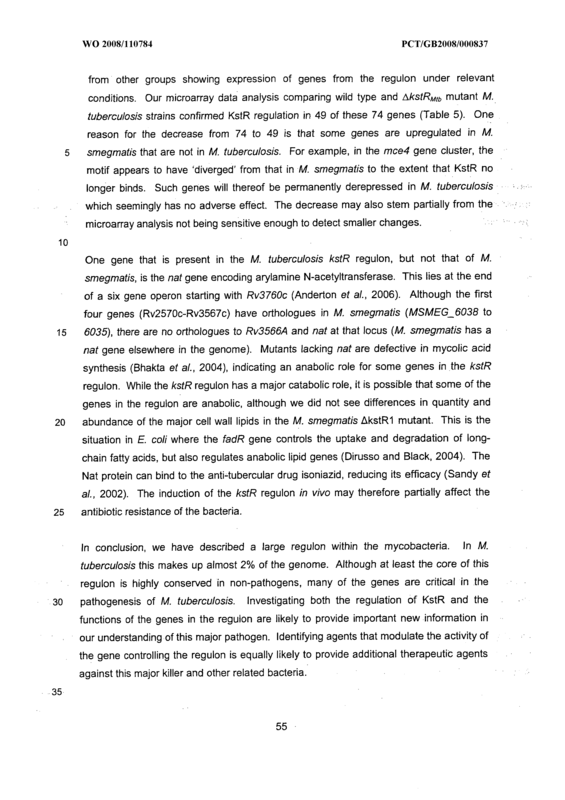 A method according to Claim 56 further comprising determining whether the test agent or modified agent modulates at least one activity or function of the M. tuberculosis Rv3574 protein or an orthologue thereof in an in vivo model of tuberculosis. 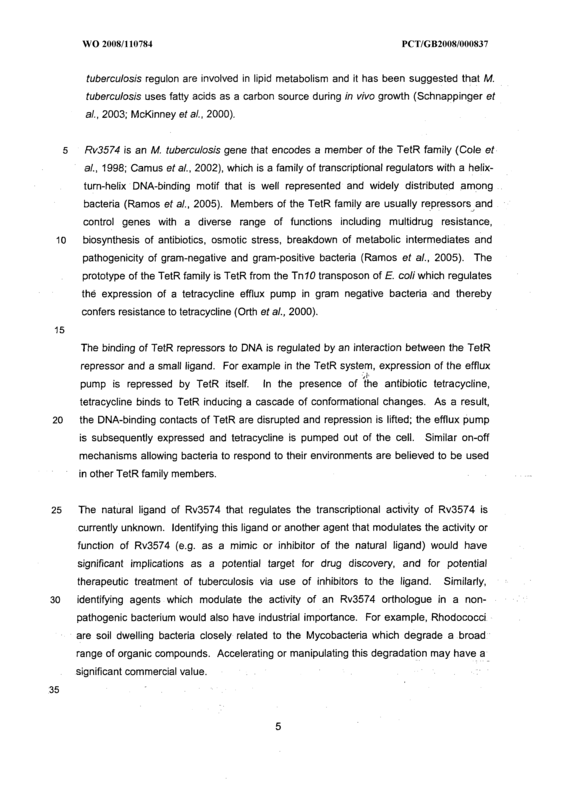 A method according to Claim 56 or 57 further comprising determining whether the test agent or modified agent modulates or affects disease severity, duration or progression in an in vivo model of tuberculosis. 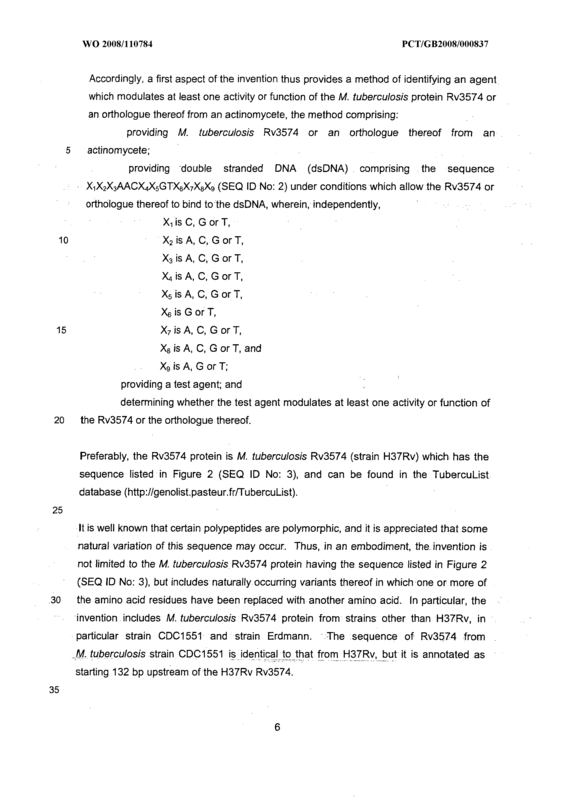 A method according to any of Claims 1-58 further comprising formulating an agent which has to ability to modulate at least one activity or function of the M. tuberculosis Rv3574 protein or an orthologue thereof into a pharmaceutically acceptable composition. 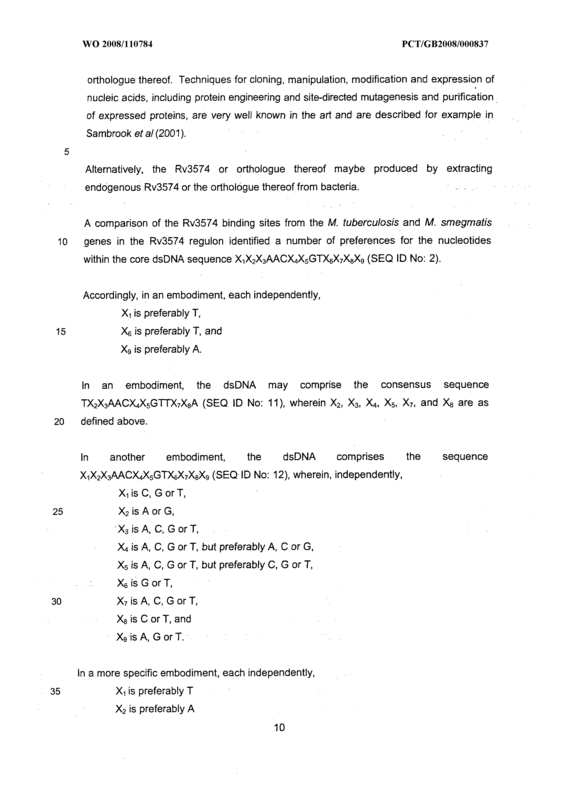 X9 is A, G or T, independently. 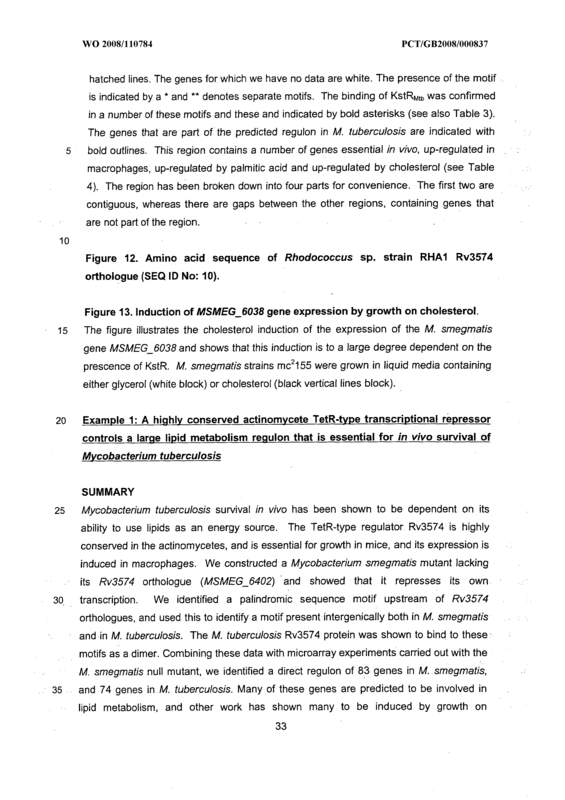 A kit according to Claim 60 wherein the isolated M. tuberculosis Rv3574 protein or orthologue thereof is as defined in any of Claims 19 and 23-25. 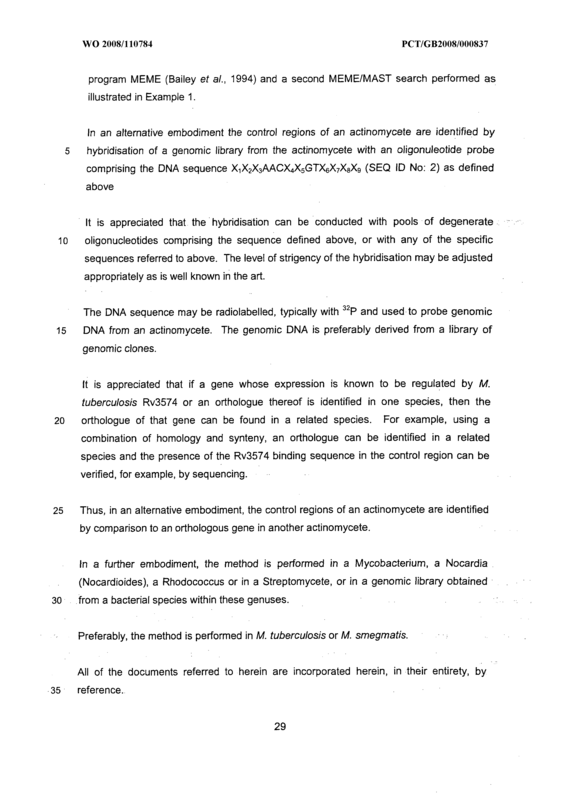 A kit according to Claim 60 or 61 wherein the dsDNA is as defined in any of Claims 2-18, 20-22 and 26-29. 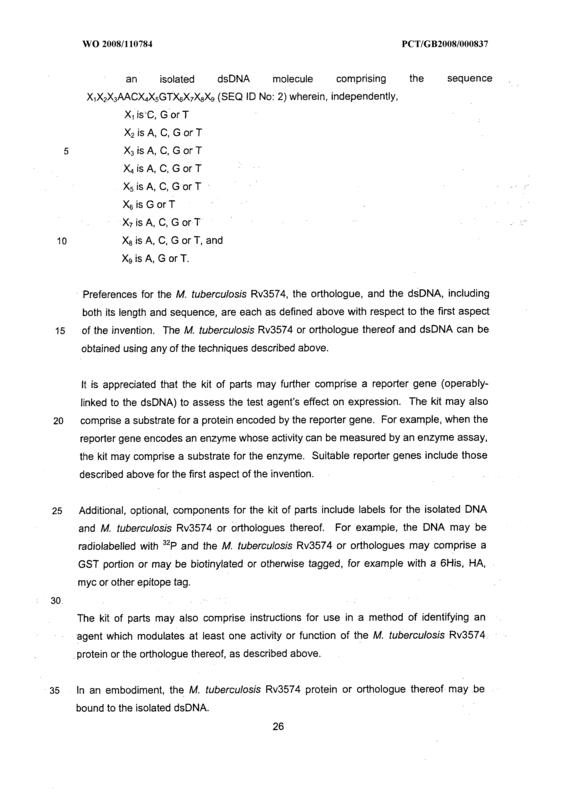 A kit according to Claim 60-62 wherein the dsDNA is operably linked to a reporter gene. 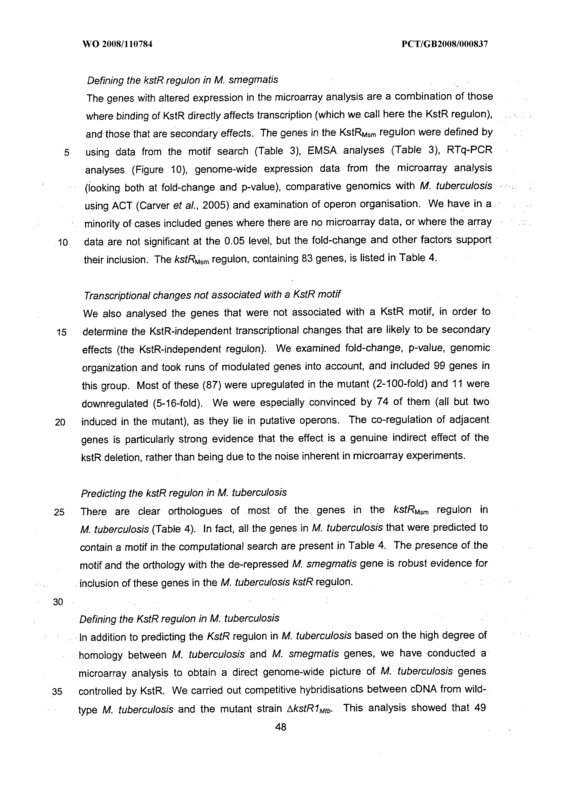 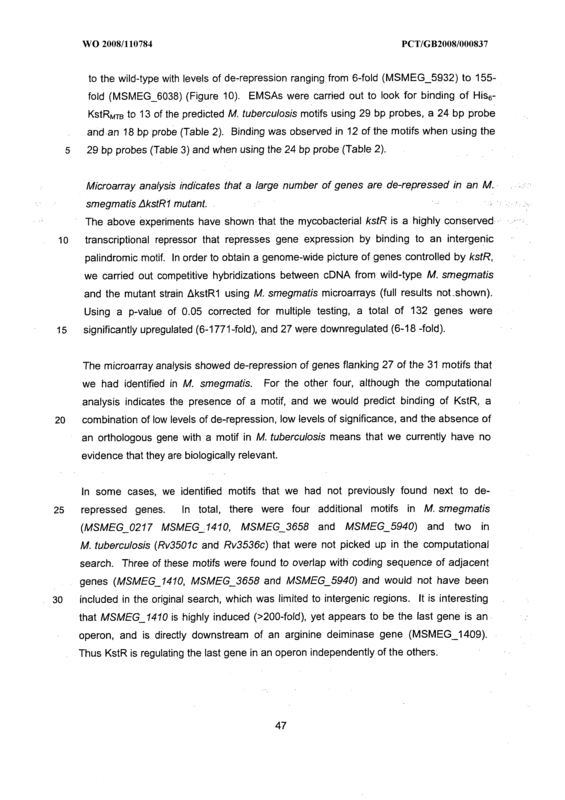 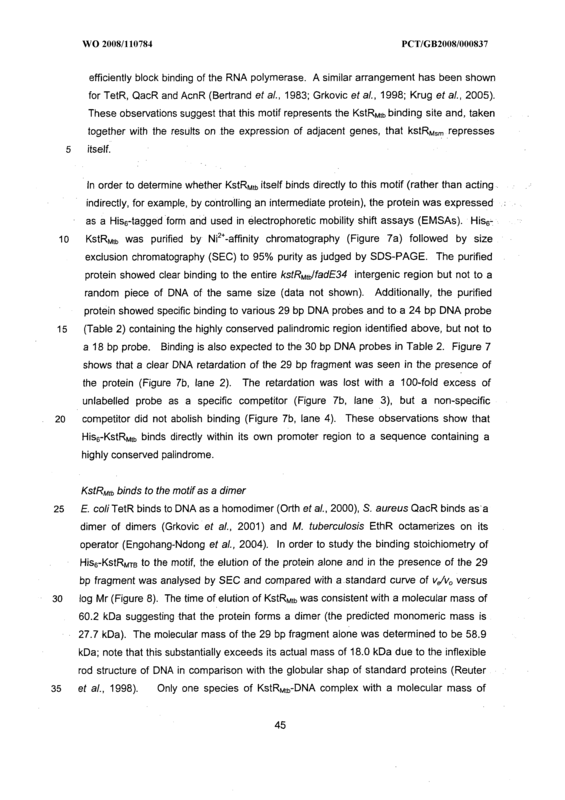 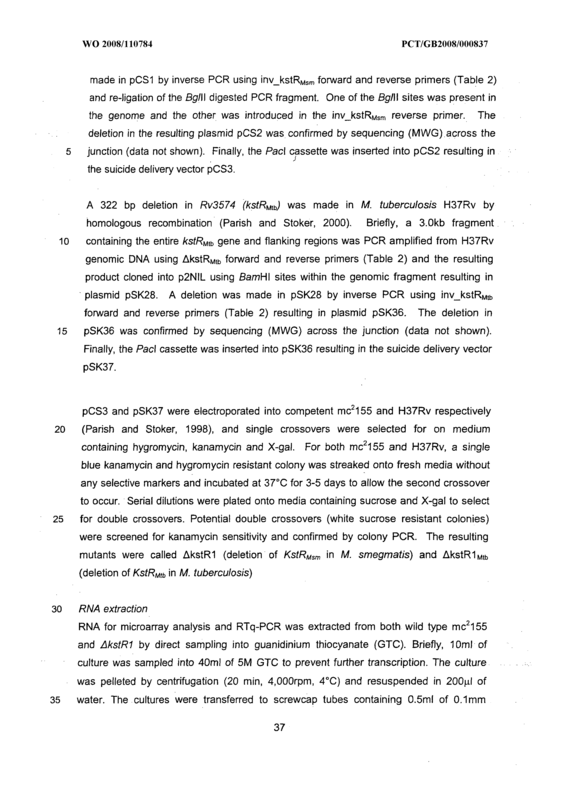 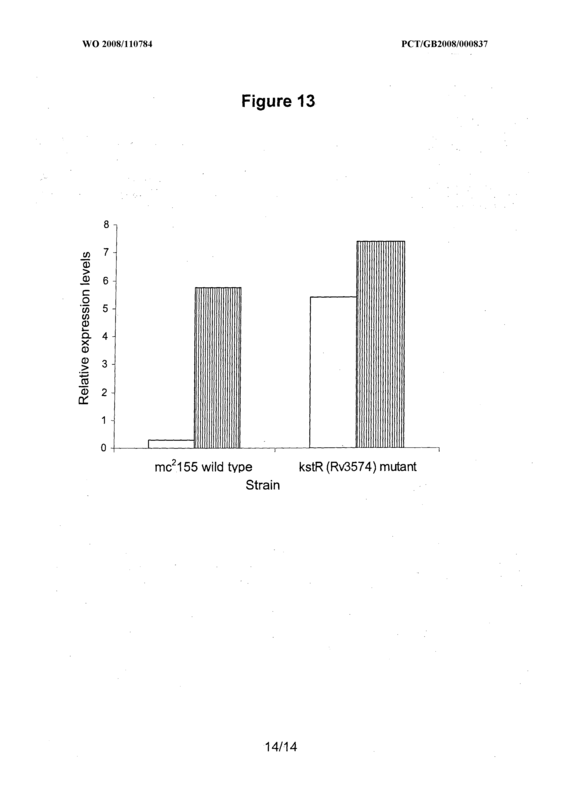 A kit according to Claim 63 further comprising a substrate for detecting the reporter gene. 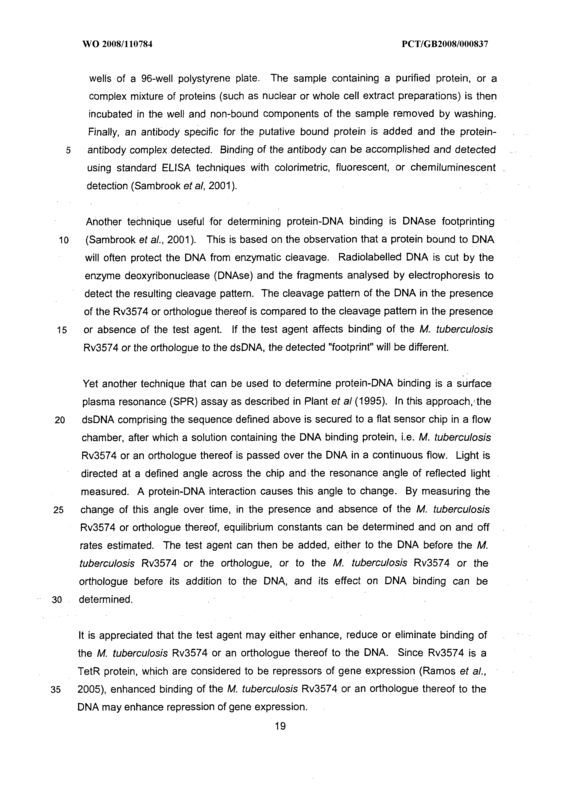 A kit according to any of Claims 60-64 wherein the Rv3574 protein or orthologue thereof is bound to the isolated dsDNA. 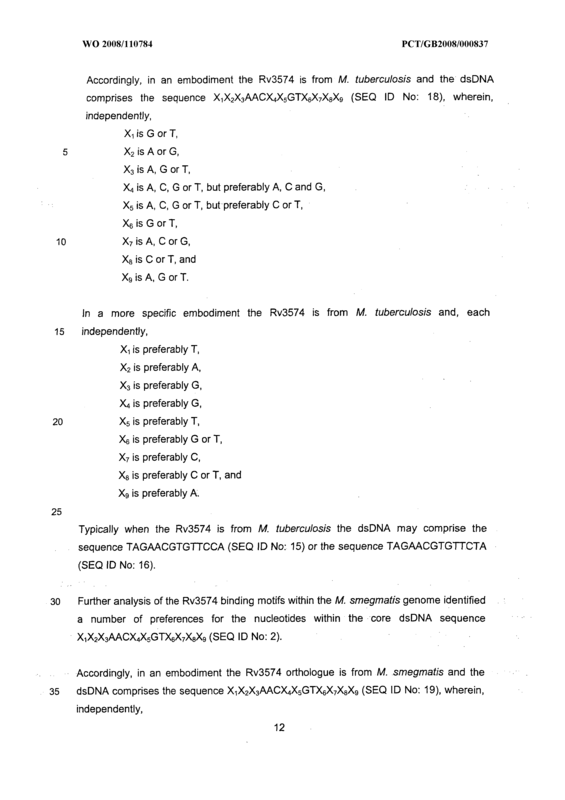 A kit according to any of Claims 60-65 wherein the isolated M. tuberculosis Rv3574 protein or orthologue thereof is bound to the dsDNA as a dimer. 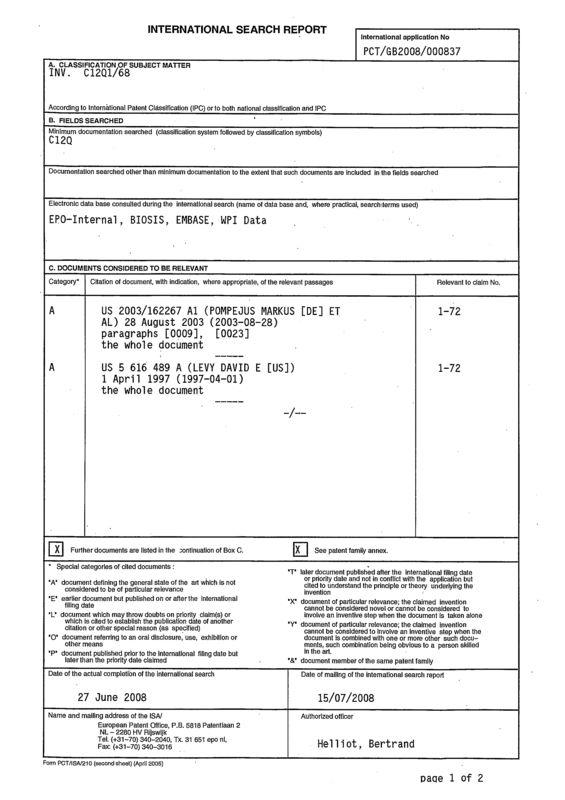 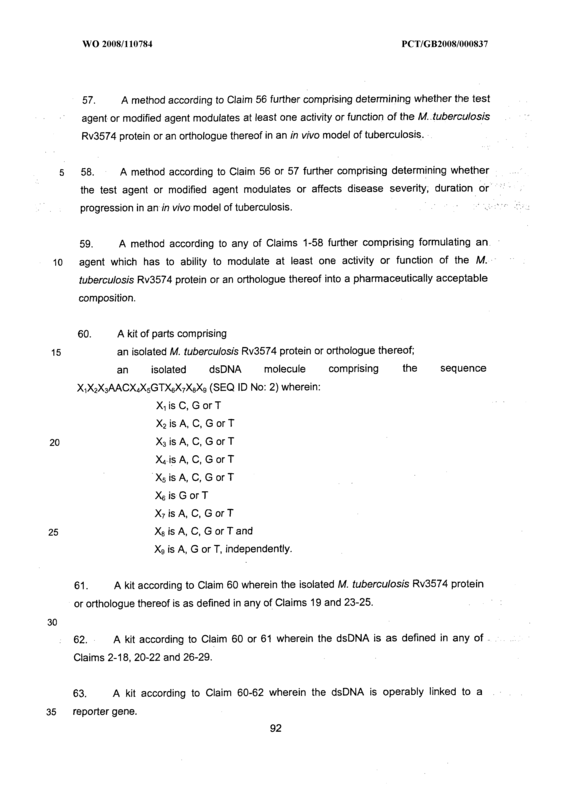 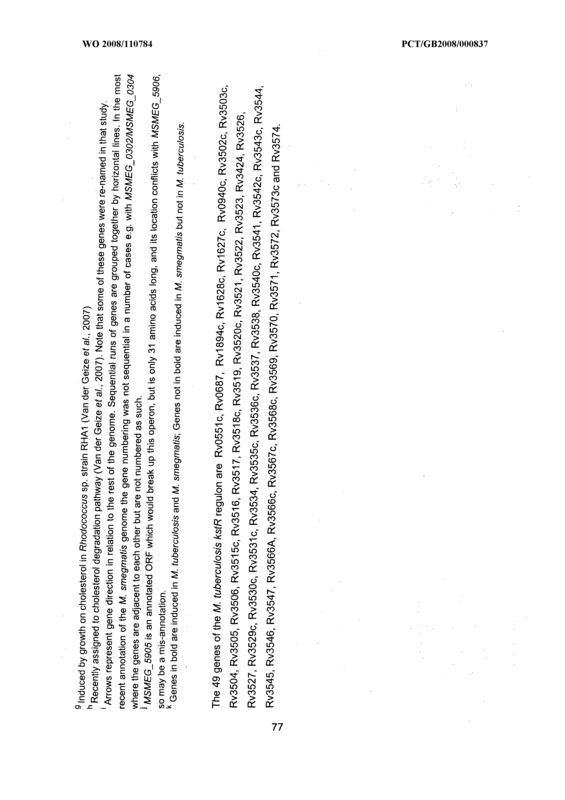 A method according to Claim 67 wherein the Rv3574 binding sequence is as defined in any of Claims 2-18, 20-22 and 26-29. 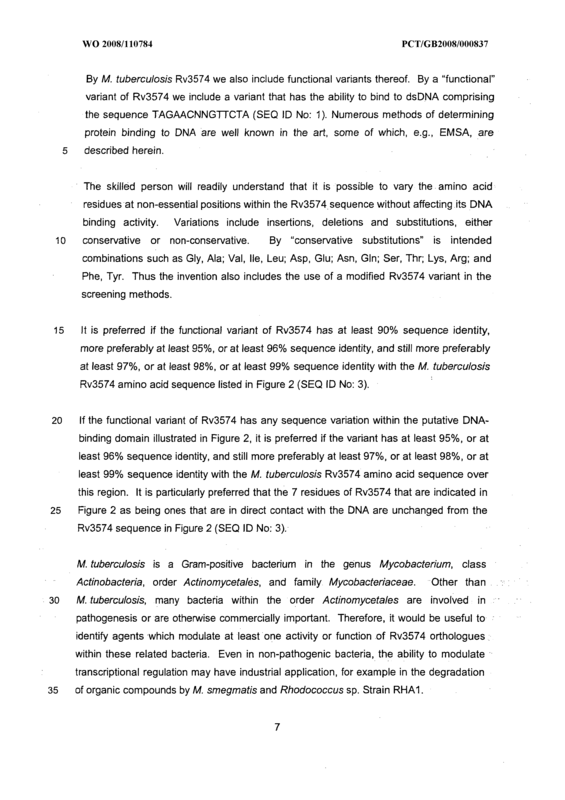 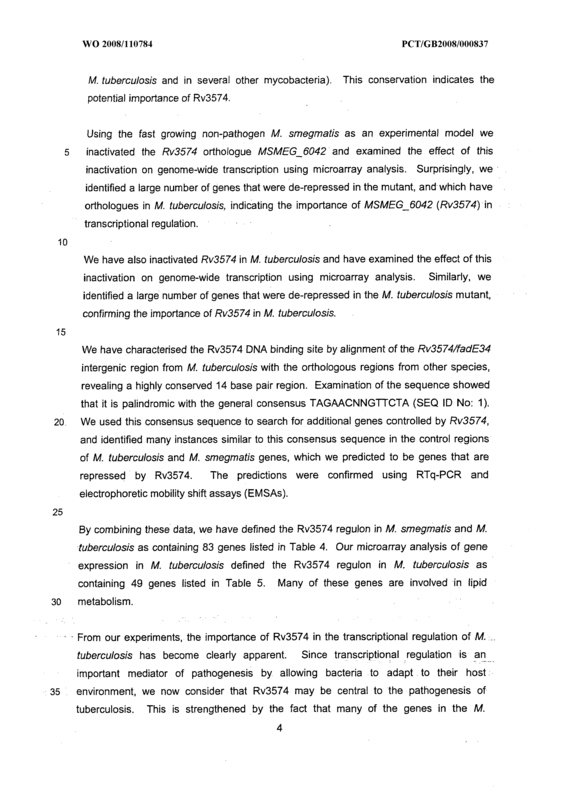 A method according to Claim 67 or 68 further comprising: determining whether the M. tuberculosis Rv3574 or the orthologue thereof affects the expression of the gene containing the Rv3574 binding sequence. 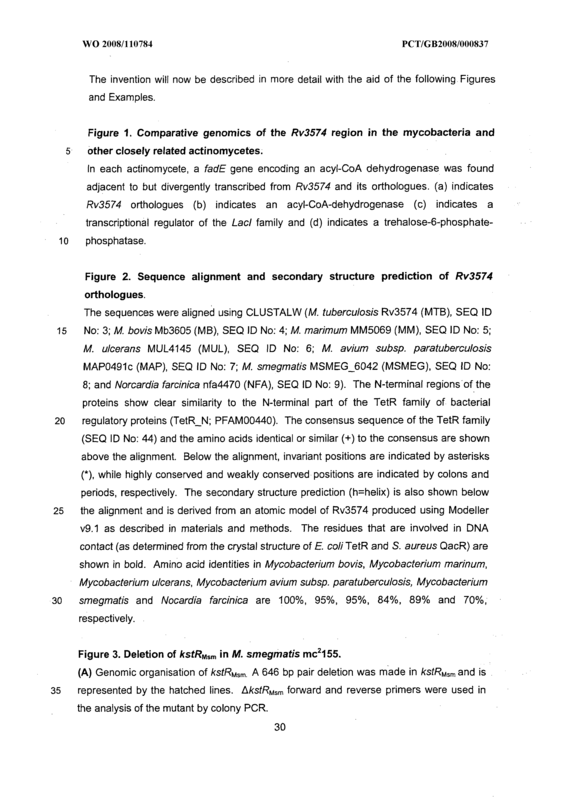 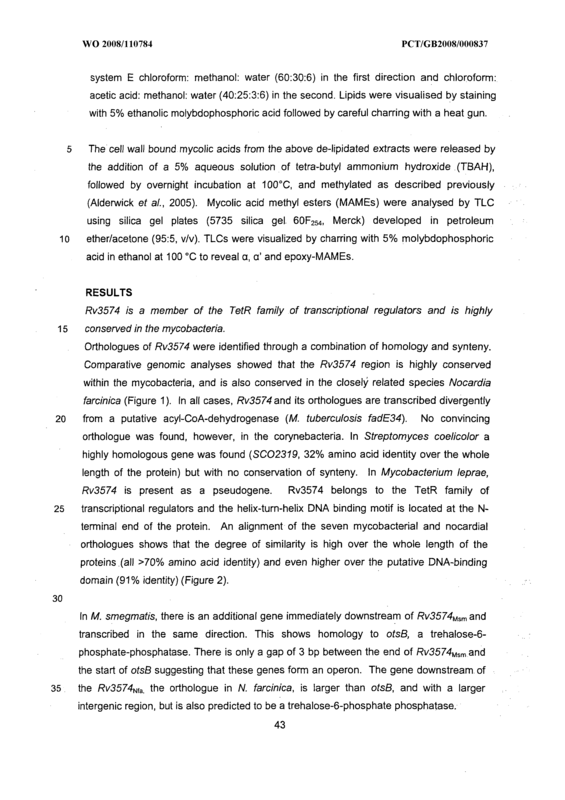 A method according to Claim 67-69 wherein the sequence is identified by searching a database in silico, by hybridisation with an polynucleotide probe comprising the Rv3574 binding sequence, or by comparison to an orthologous gene in another actinomycete. 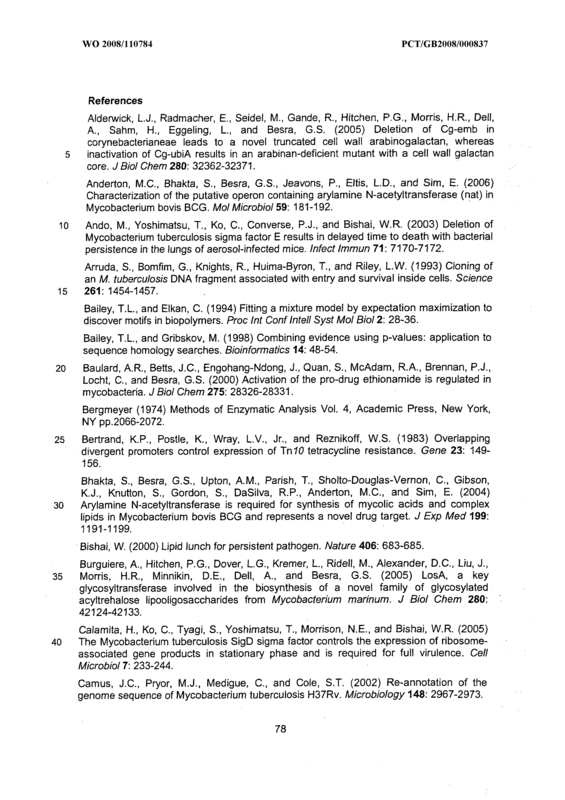 A method according to any of Claims 67-70 wherein the actinomycete is a Mycobacterium, a Nocardia (Nocardioides), a Rhodococcus or a Streptomycete. 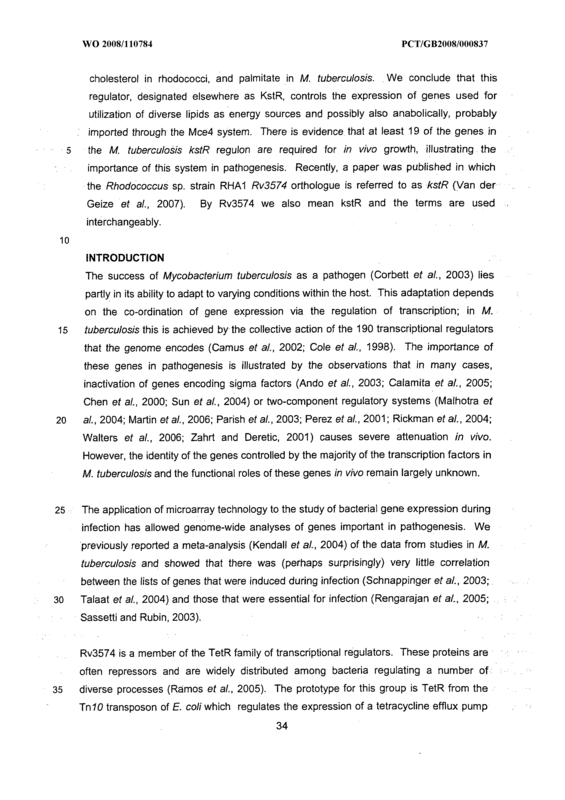 A method according to Claim 71 wherein the Mycobacterium is M. tuberculosis.